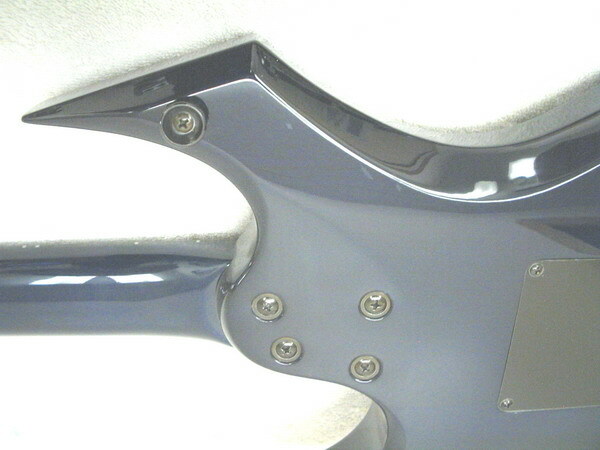 Unlike similiar looking ESP's sold elsewhere,all ESP guitars from our store feature our own Custom Shop Setup, including shielding for improved noise rejection and performance,Neutrik jack upgrade for improved reliability, pro level fretwork which allows us to offer better than"stock", effortless playability and fast action height of less than 3/32".We also replace the sub-par tone control found on the "stock" versions sold by other stores with our own custom Dual Voice Tone control.Our Dual Voice Tone gives you TWO unique sounding,musically useful tones,in addition to a "Sparkle-Boost" mode that adds a top-end "kick", a much appreciated bonus that helps any guitar loaded with humbucker pickups cut through the mix.Our DVT control is an exclusive feature on all ESP's WE sell & NOT available on any ESP versions sold elsewhere.Besides the added value features listed here,WE also a include a premium,heavily padded gigbag(NOT a glorified garbage bag with an attached zipper like we so commonly see thrown in to close the deal these days.) 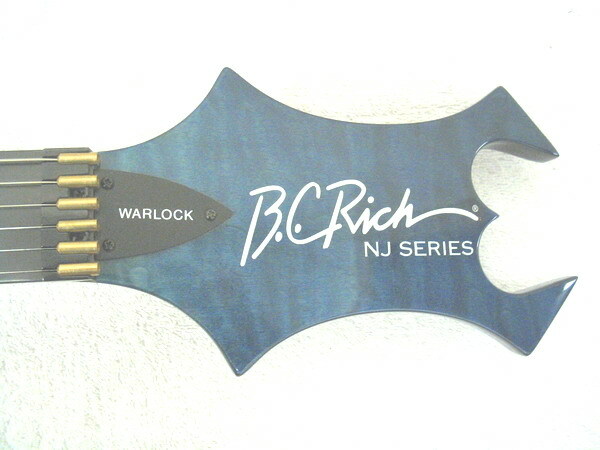 The best bang-for-your-ESP-bucks is from our shop! 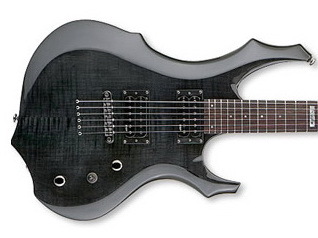 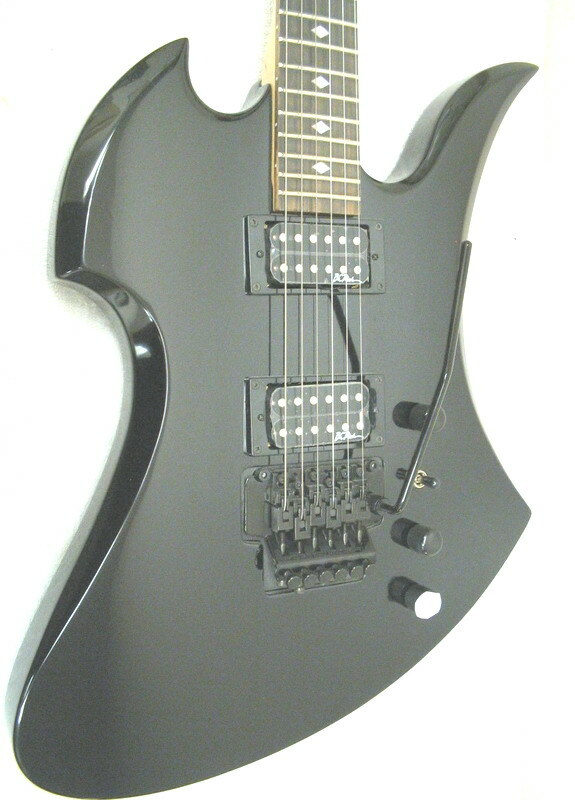 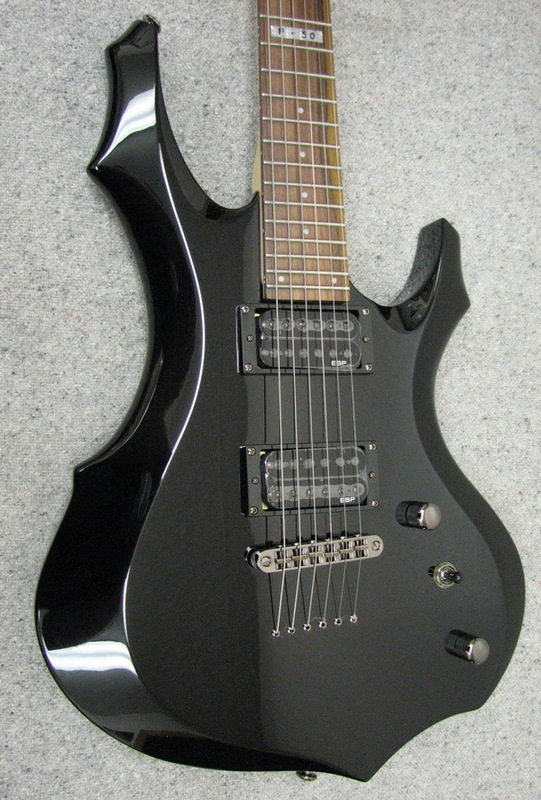 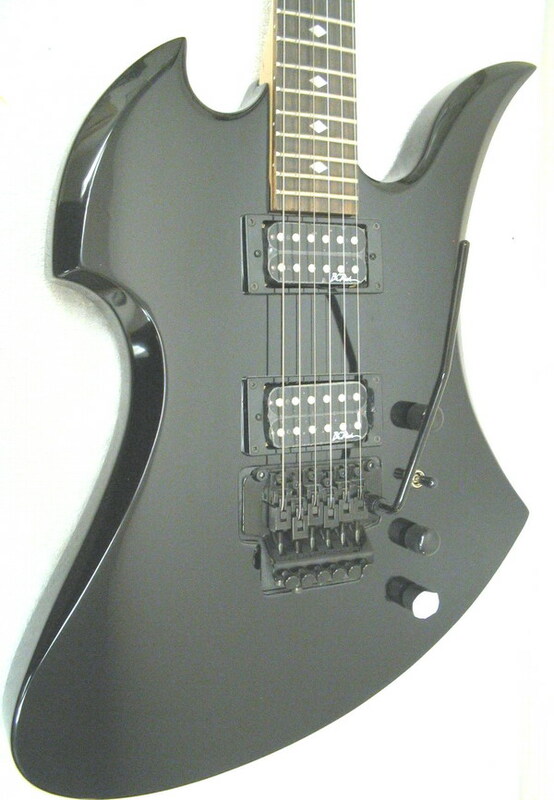 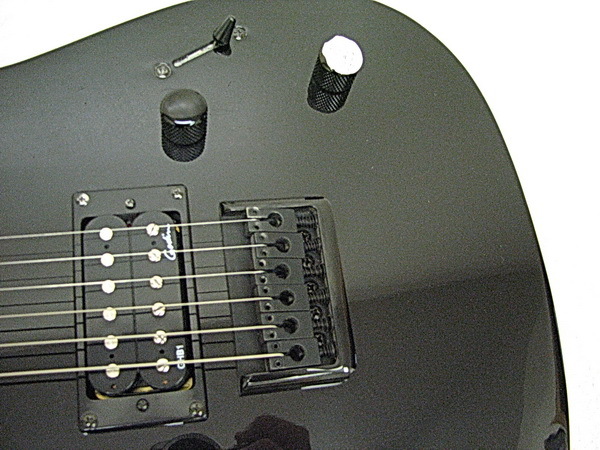 see why even our lower priced guitars outperform our competitor's higher priced versions! 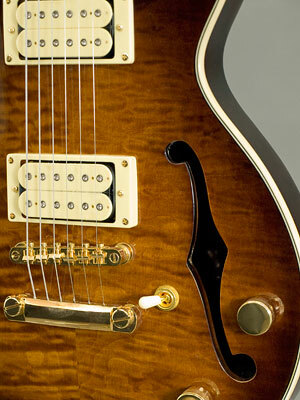 The LTD SN-200 is perfect for any player that appreciates traditional styling in a guitar, but wants more modern performance tools at their grasp, and needs it all at a very affordable price. 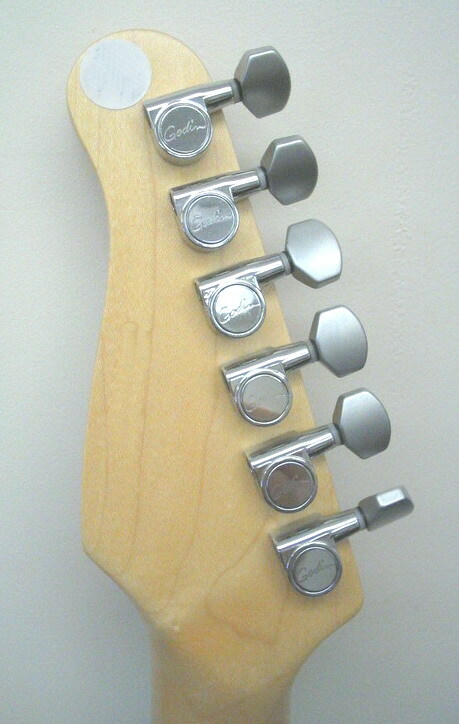 These classic bolt-on designs are great for almost any style of music where great tone and smooth playability are important. 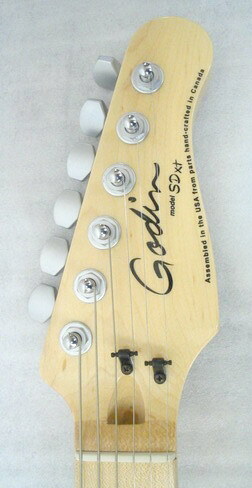 They features basswood bodies, maple necks, and models with Floyd Rose or Wilkinson tremolos, and hardtail versions as well. 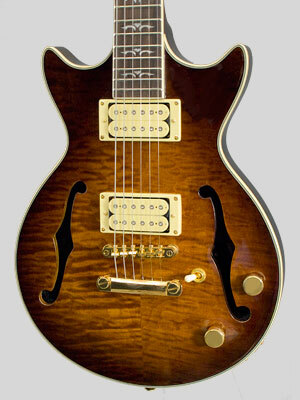 Available in a variety of finishes, the SN-200 also includes acclaimed ESP Designed pickups.Limited edition Copper sunburst finish. 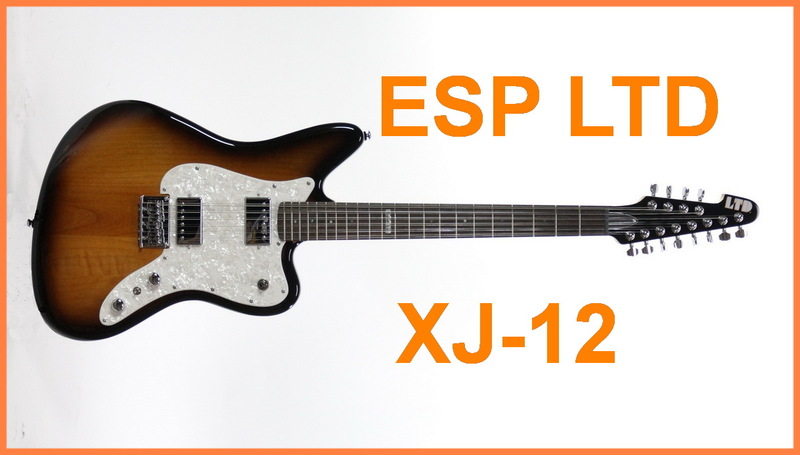 The Xj12 version,is a twelve string electric that you can tune and play at normal pitch and actually intonate properly,thanks to the advanced ESP Goth bridge design.The xj12 also sports a matched pair of Seymour Duncan humbuckers with coil tap(for extra jingle-jangle! 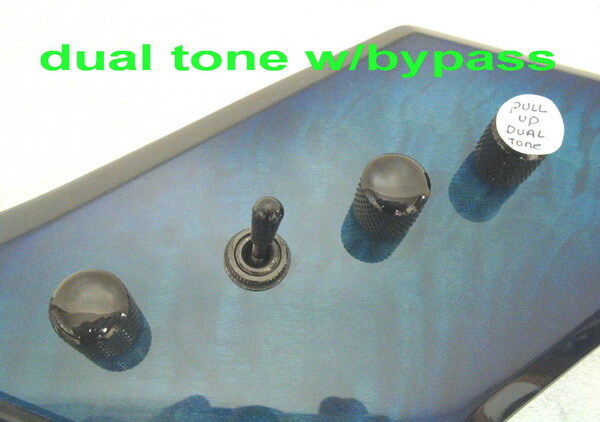 )and our own re-voiced tone control mod. 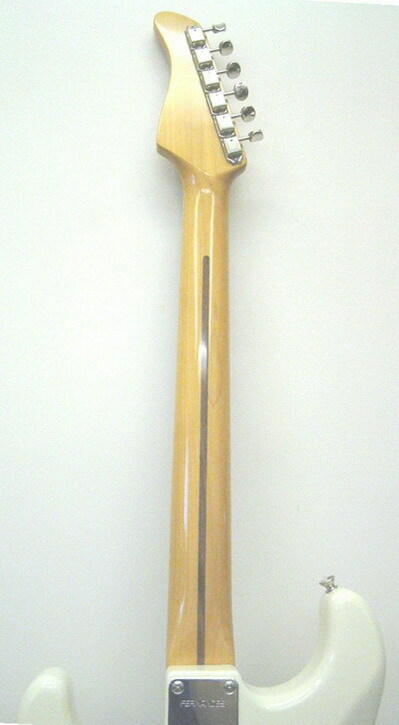 Featuring a basswood body with radically cut contours & bevels for added comfort and string-thru-design for added sustain.The extended 25.5" scale maple neck features a rosewood fingerboard with 24 extra jumbo frets, professionally levelled and finished in our own shop to yield superior,superb, effortless playability with better than "factory spec" action & performance. 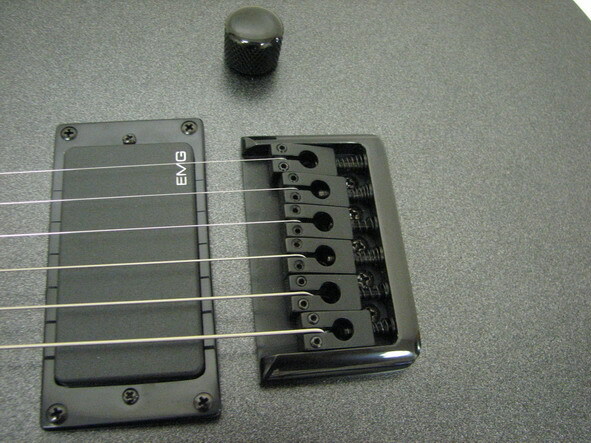 Dual,open face humbucker pickups controlled by a master volume control & selected by a 3-way bat-handle toggle switch. 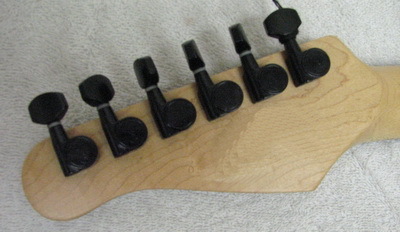 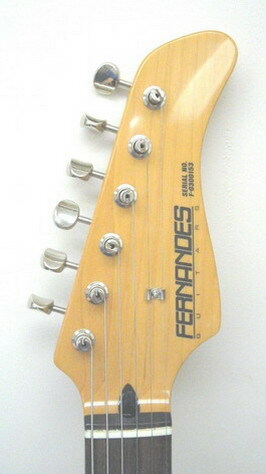 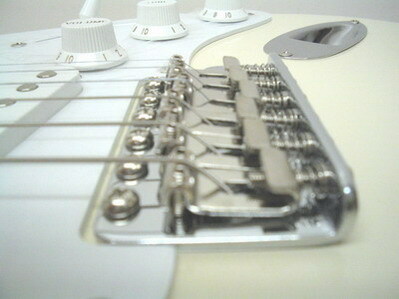 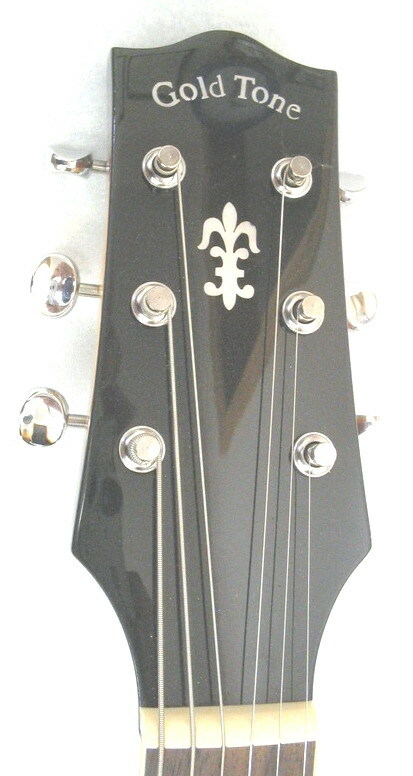 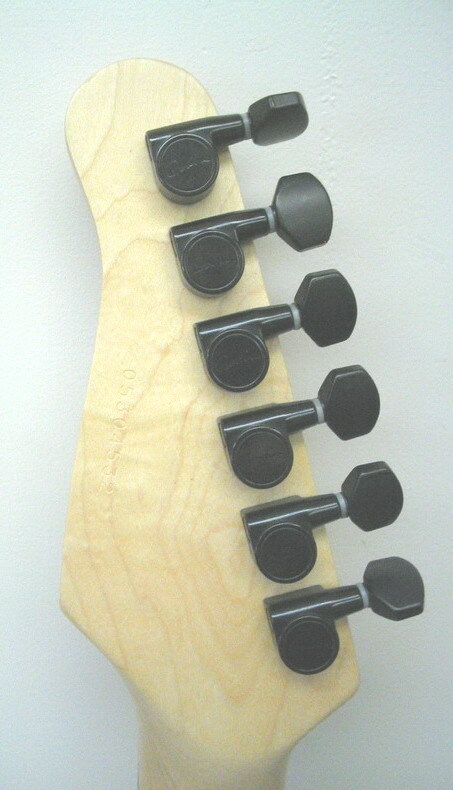 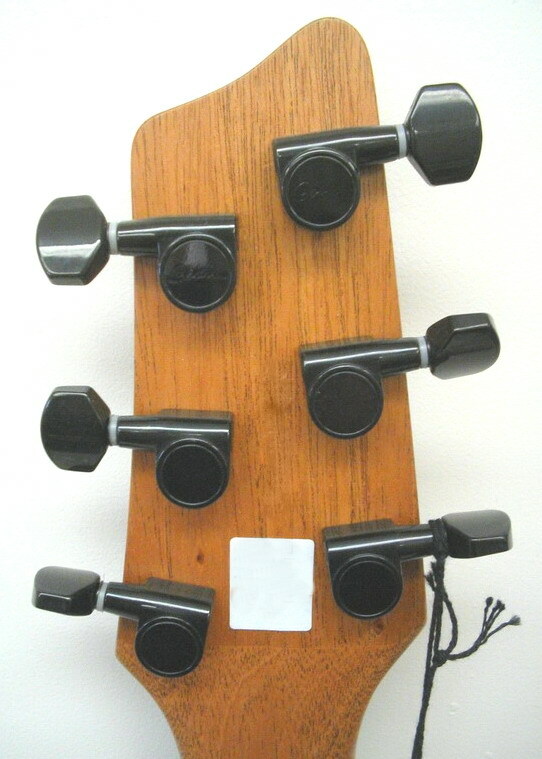 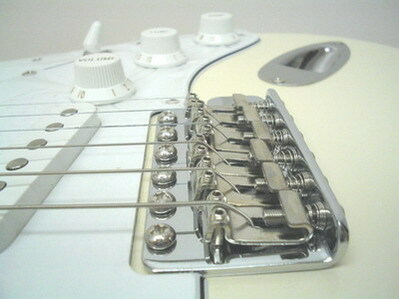 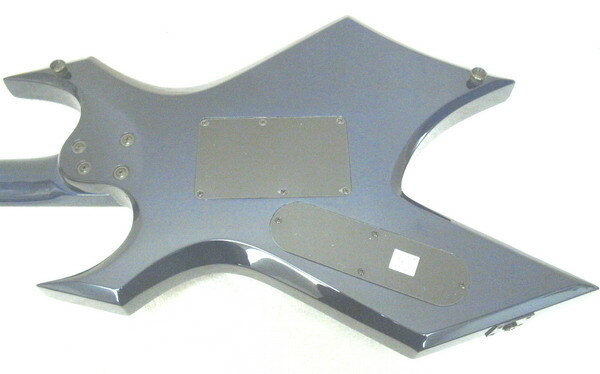 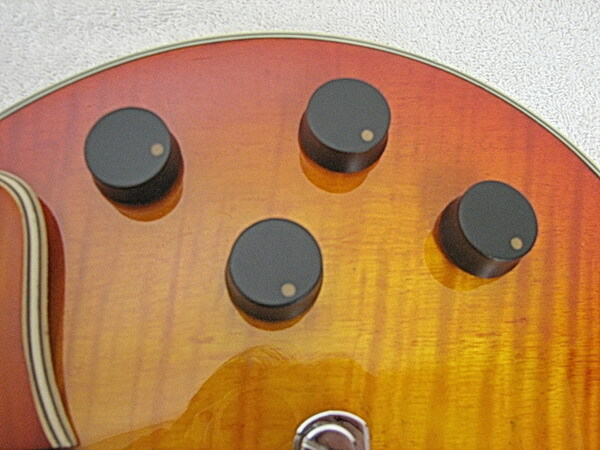 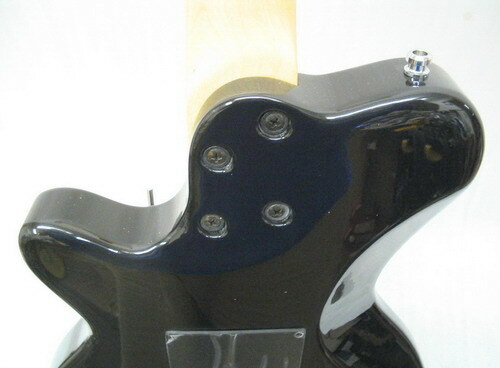 Diecast,sealed tuners for smooth and stable tuning.Fully adjustable bridge. 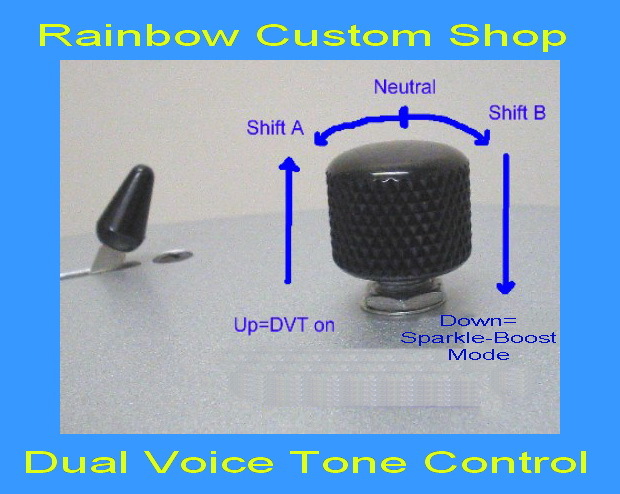 as well as upgrading to a Neutrik positive contact jack for improved cable connection & reliability.Included exclusively with our shop setup is our own DVT control, offering TWO additional,musically useful tones and a "Sparkle-Boost" mode(the name says it all! 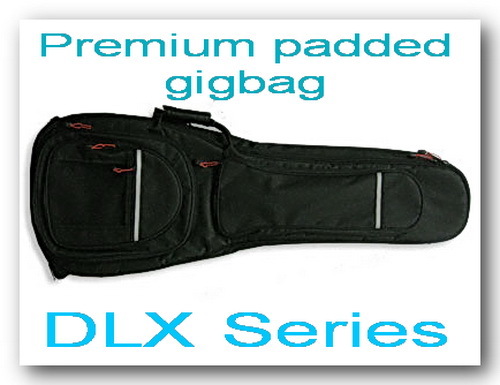 ).Premium padded gigbag included and our TWO year free,seasonal maintenance coverage plan.Black Gloss. 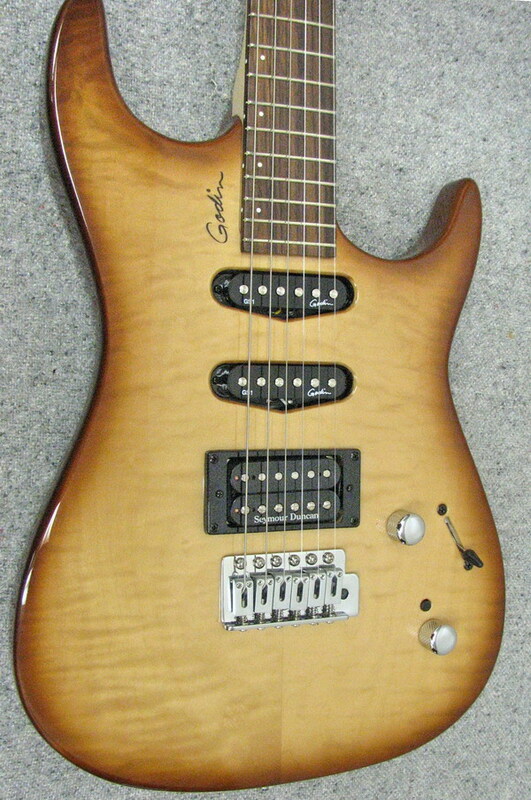 Featuring a basswood body with a superb,flamed maple top and radically cut contours & bevels for added comfort .The body also sports a string-thru-design for added sustain.The extended 25.5" scale,bolt-on maple neck features a rosewood fingerboard with 24 extra jumbo frets, professionally levelled and finished in our own shop to yield superior,superb, effortless playability with better than "factory spec" action(less than 3/32") and performance. 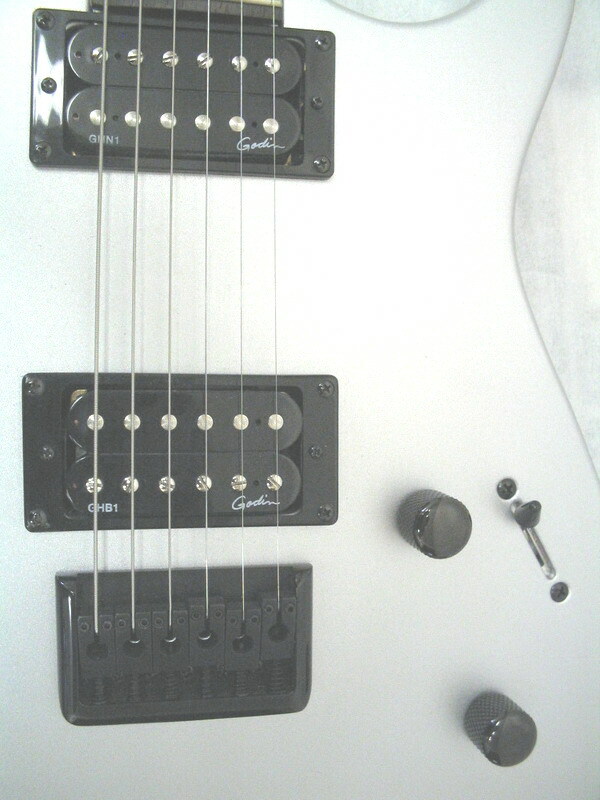 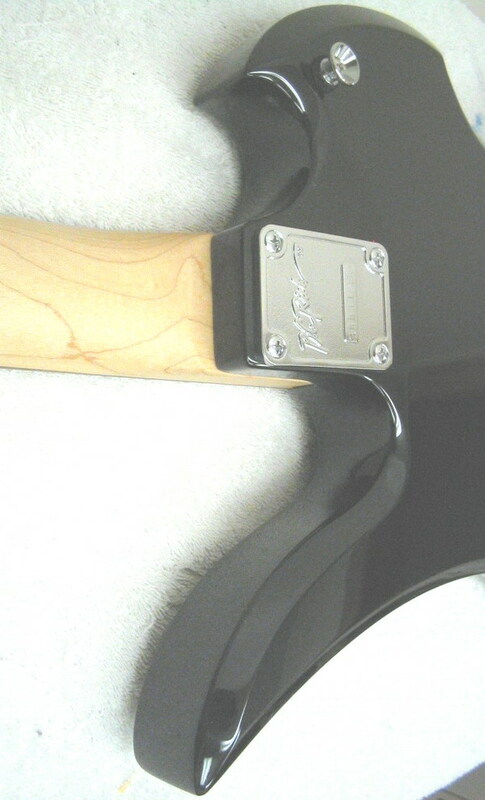 Dual,open face humbucker pickups controlled by a master volume control are selected by a 3-way bat-handle toggle switch. 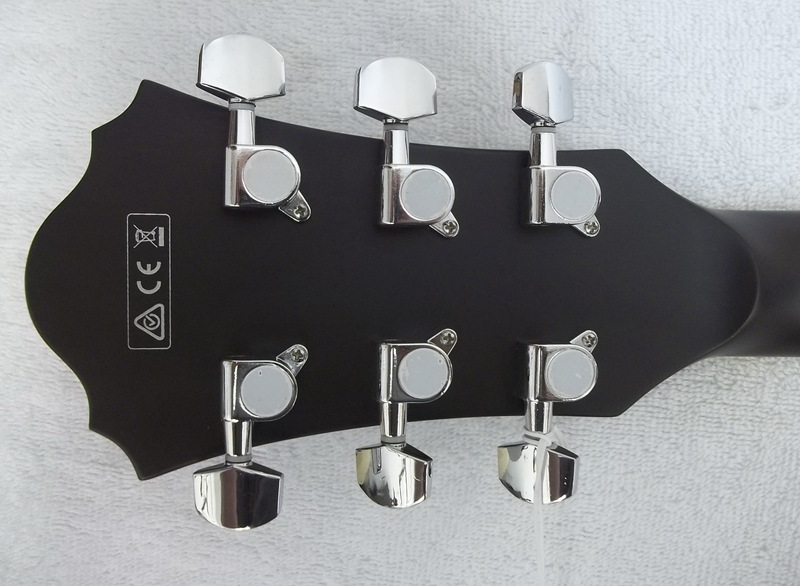 up to an even more, bang-for-your-buck level, by actually taking the time to set them up,extremely well, in our own shop, to play considerably better than what you'd find elsewhere. 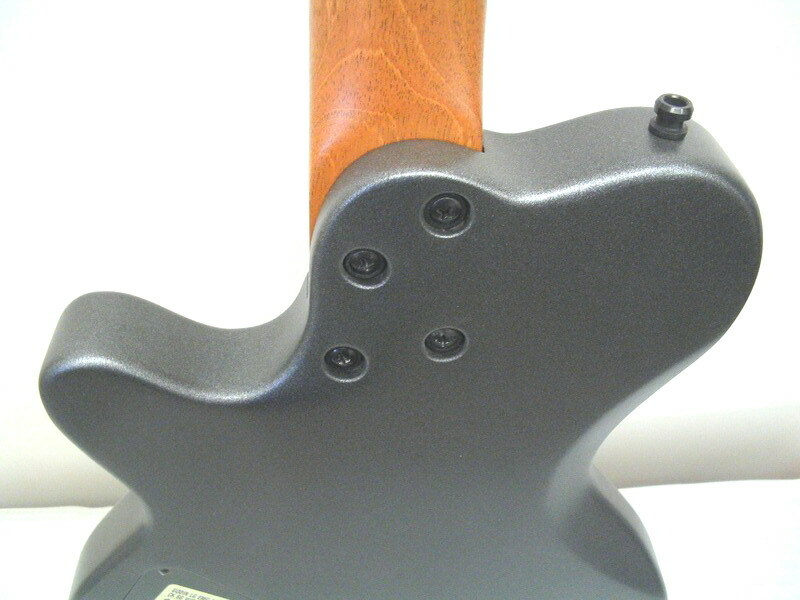 We've also added our own custom DVT control,specially voiced for this guitar,giving you some very cool "pinched & scooped".mid-tones you won't get from "stock" m17 models sold elsewhere. 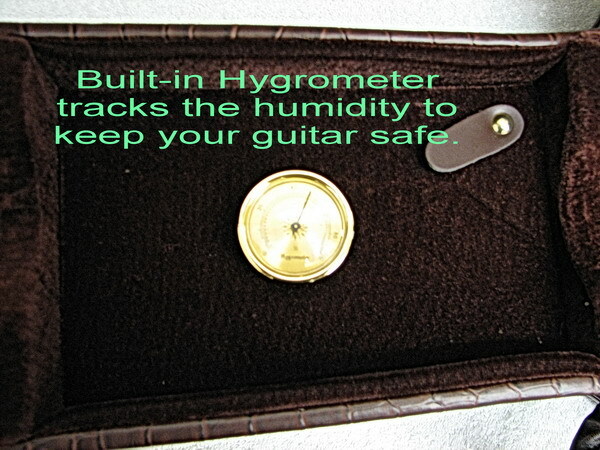 (great for hard rock & metal players!). 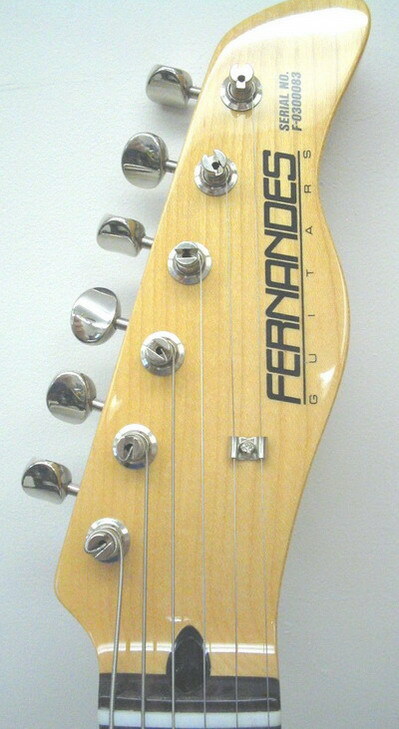 vintage "F" guitars with all the familiar playability of the oldies,individually customized in our own shop. 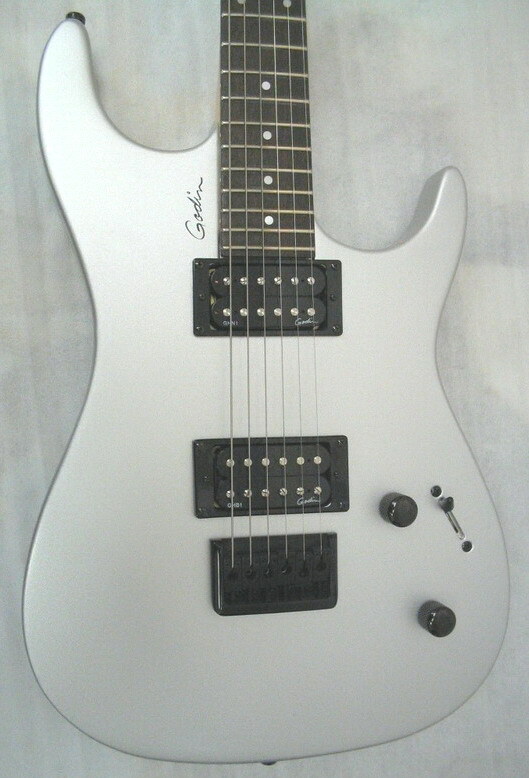 "S" style electric.maple fingerboard.creme finish.21 fret maple fingerboard with "skunk stripe" on back of neck.Split shaft "K" style tuners finished in vintage nickel.Vintage open fold saddlesAged neck finish.Width at nut:1.65"/width at 12fret: 2.05"
hardshell case included. 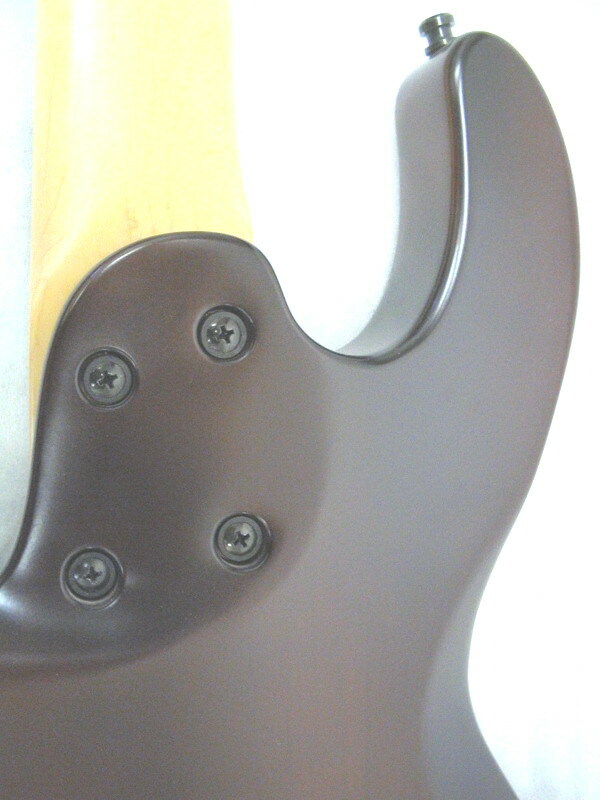 HIGH QUALITY JAPANESE CRAFTED. 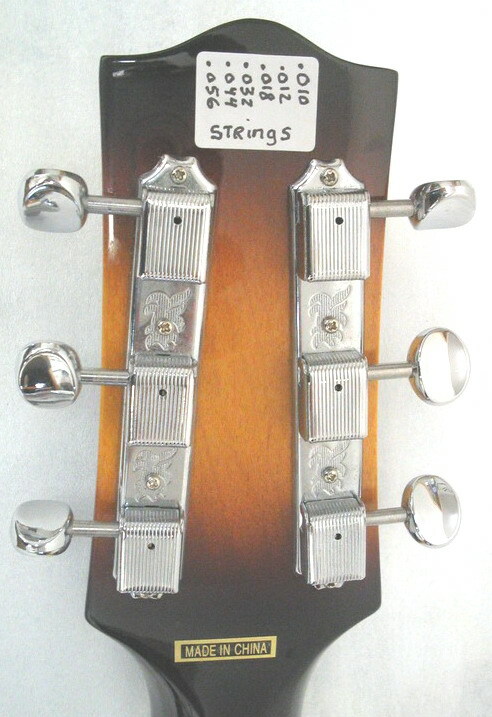 "S" style electric.rosewood fingerboard.creme finish.21 fret rosewood fingerboard with "skunk stripe" on back of neck .Split shaft "K" style tuners finished in vintage nickel. 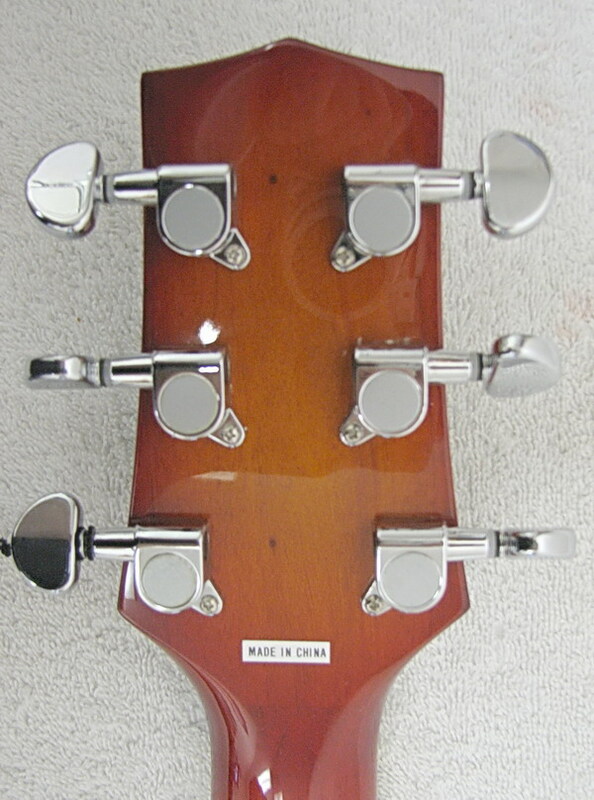 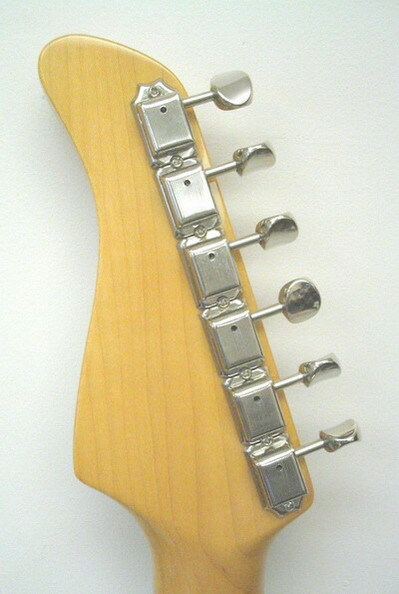 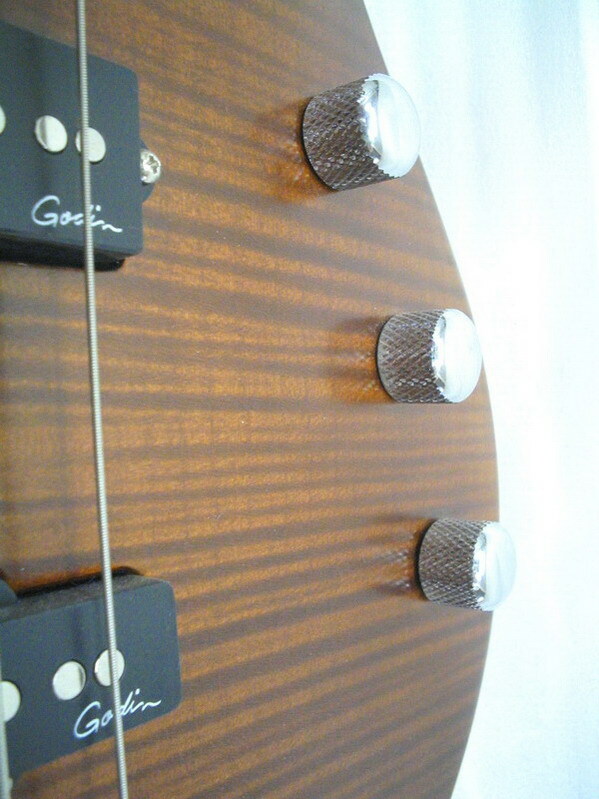 Vintage open fold saddles.Aged neck finish.Width at nut:1.65"/width at 12fret: 2.05"
"T" style electric.rosewood fingerboard,vintage natural finish .21 fret rosewood fingerboard with "skunk stripe" on back of neck .Split shaft tuners finished in vintage nickel.Vintage style triple barrel saddle "ashtray" bridge. 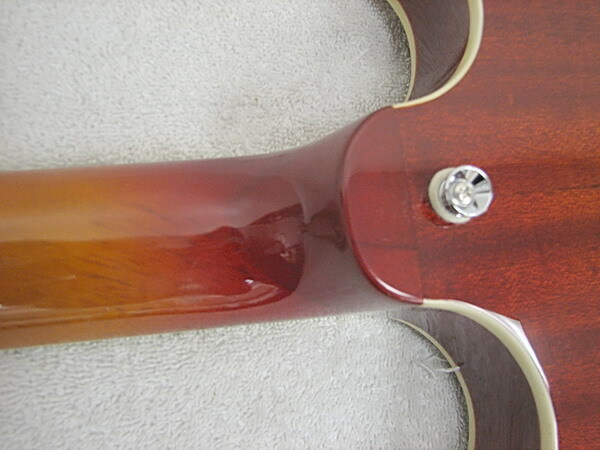 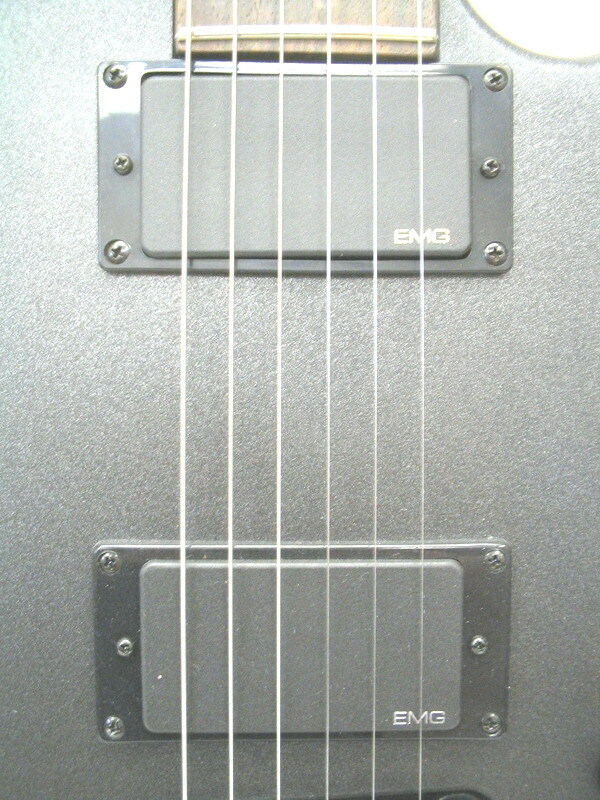 Width at nut:1.65"/width at 12th fret: 2.02" . 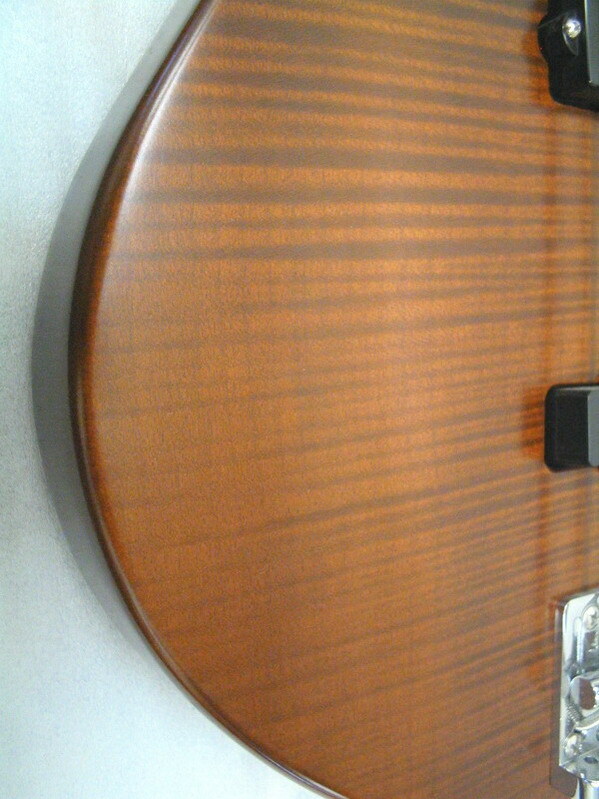 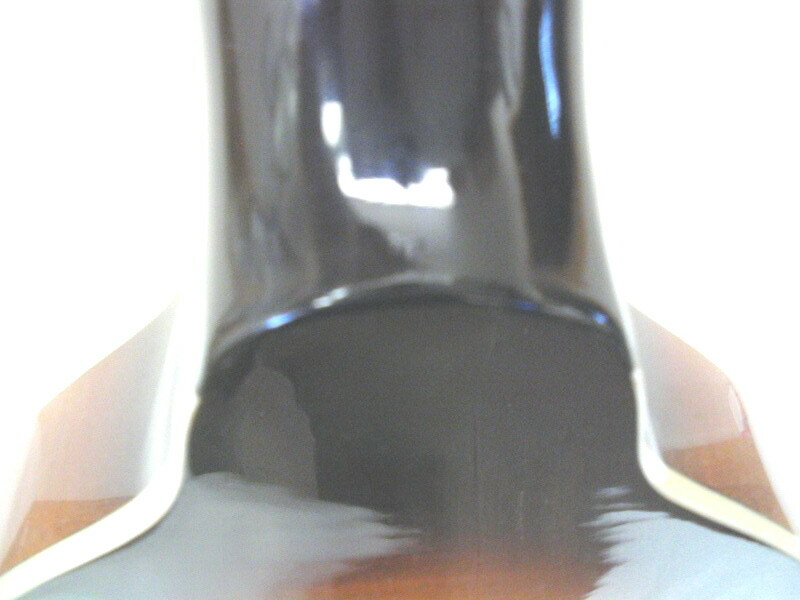 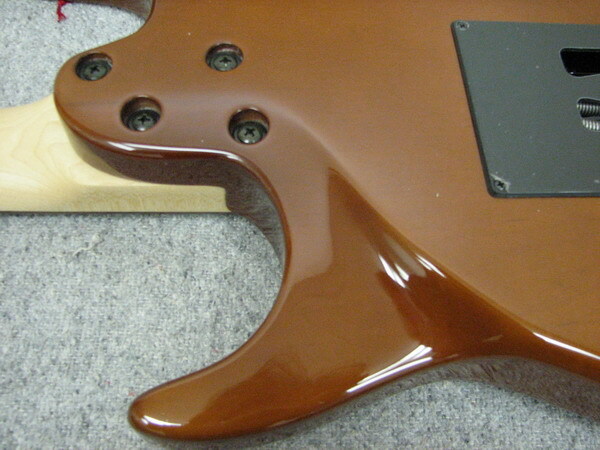 Aged honey gloss ,natural finish. 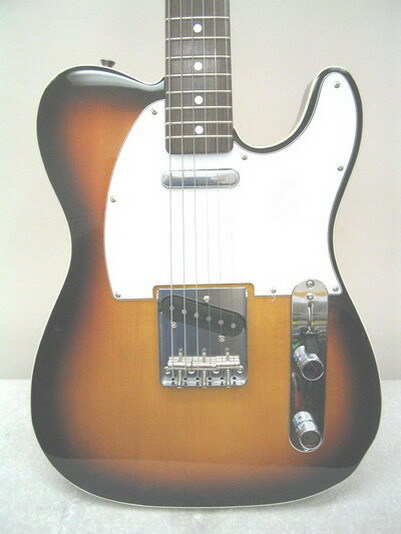 "T" style electric.rosewood fingerboard,3 tone sunburst finish .21 fret rosewood fingerboard with "skunk stripe" on back of neck Split shaft "K" style tuners finished in vintage nickel. 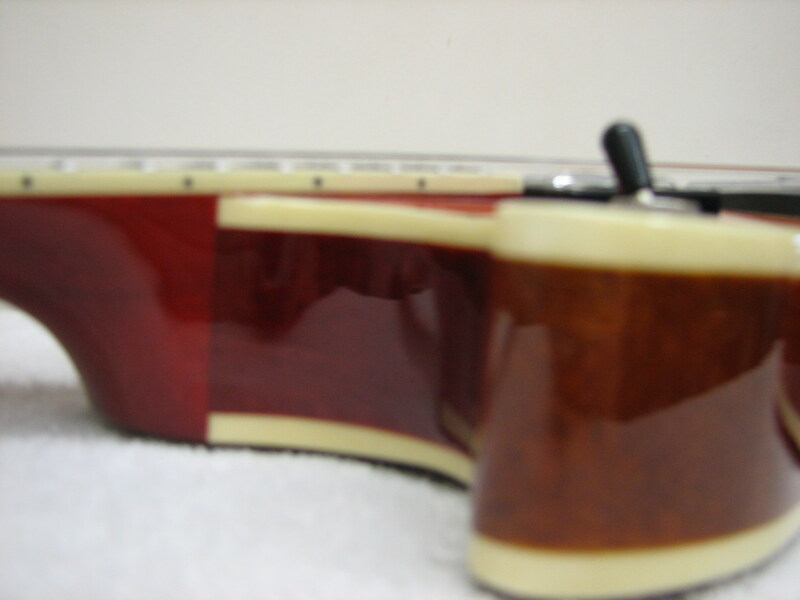 Vintage style triple barrel saddle "ashtray" bridge.Double bound body. 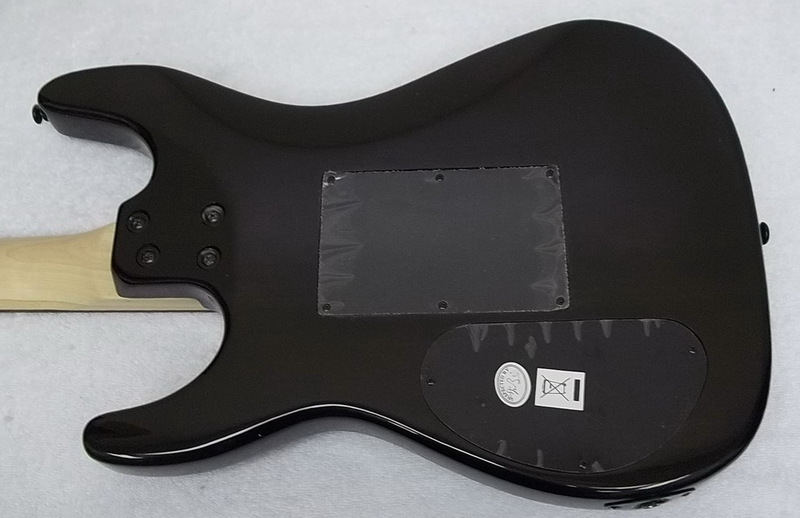 Width at nut:1.65" / width at 12fret: 2.02"
Includes Rainbow Custom Shop setup fretwork & 3/32" action and Rainbow Custom Shop DVT Control for more tone options than "factory stock" models! 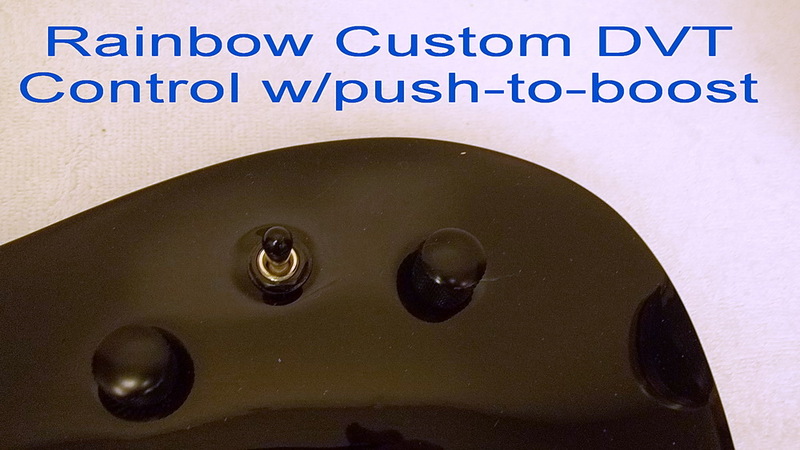 Includes Rainbow Custom Shop setup, fretwork & 3/32" action and Rainbow Custom Shop DVT Control for more tone options than "factory stock" models! 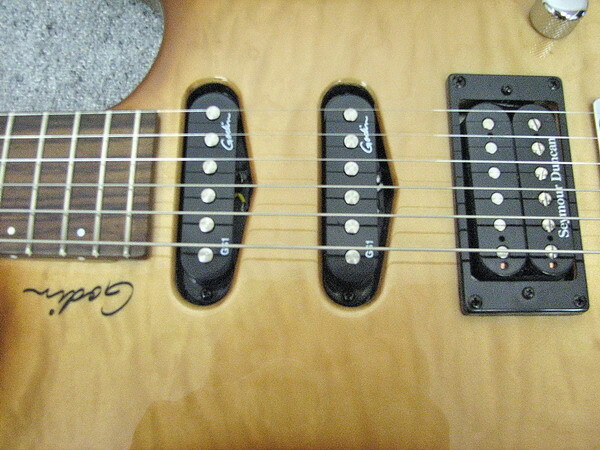 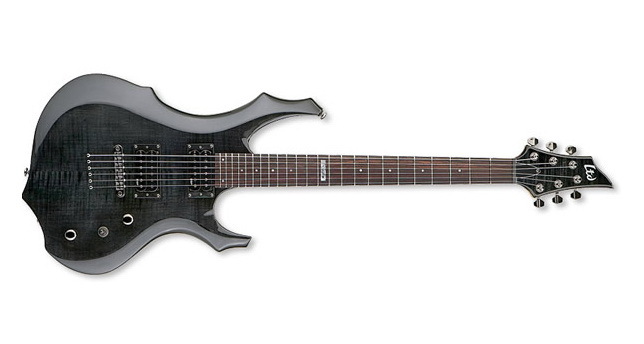 The Custom 350 Floyd provides powerful guitar tone with hot Floyd Rose action. 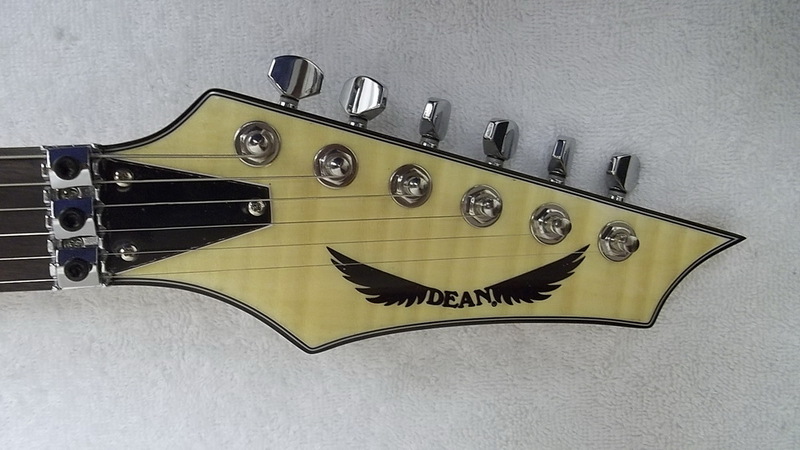 Dean continues to outdo themselves by creating brilliant sounding instruments with choice woods and electronics. 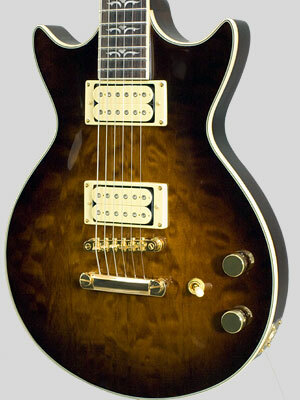 The Custom 350 Floyd features a fast 24 fret C-shaped neck, double cutaway basswood body and a flame maple top. 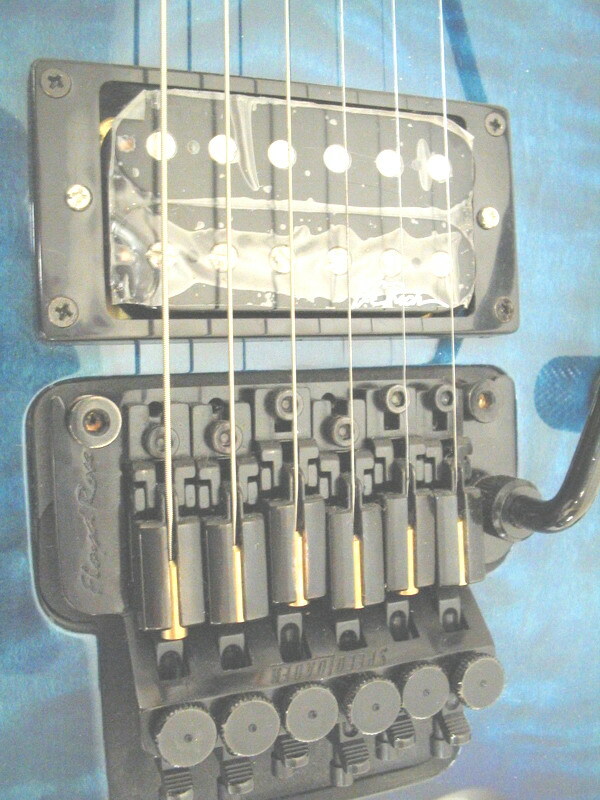 The Dean DMT humbuckers offer high output tone while the Floyd Rose Special tremolo will fill your playing with extensive trem tricks. 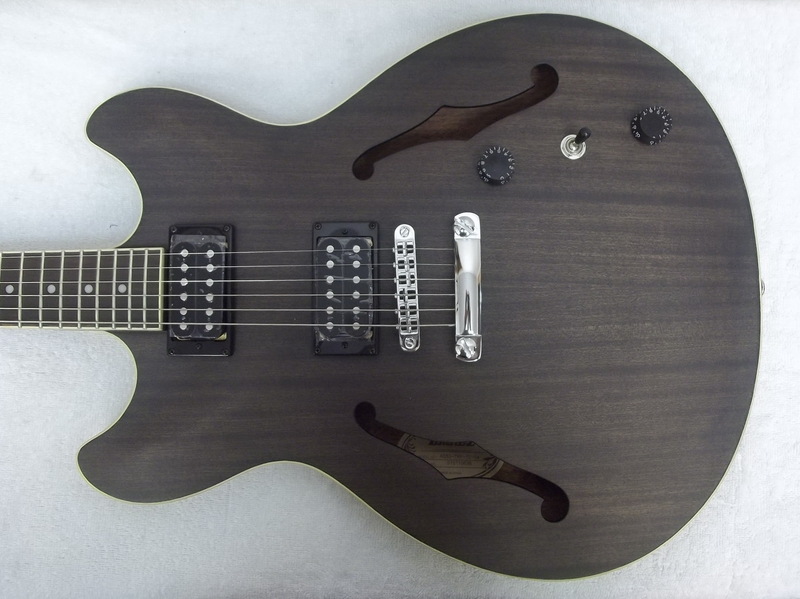 The Dean Custom 350 Floyd is equipped with coil tapping on the push/pull volume knob allowing the player to split the humbuckers into single coils for a versatile set of guitar tones.Unlike Dean Custom models sold elsewhere,Our version includes our own custom shop setup with pro-level fretwork and <3/32" action for effortless,superior fast action & playability.WE also include our own Rainbow Custom Dual Voice Tone Control for even more tonal variety than "stock" Deans sold elsewhere. 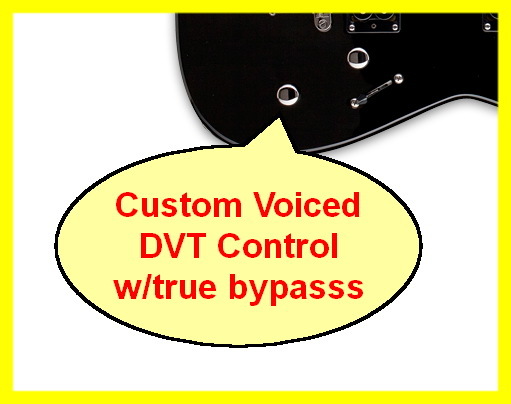 Our DVT control also features a push-to-boost bypass mode for adding more "sparkle" to the humbucker AND single coil modes.This exclusive DVT control and pro setup is ONLY available from our shop.We also a include a premium quality,padded case for protection. 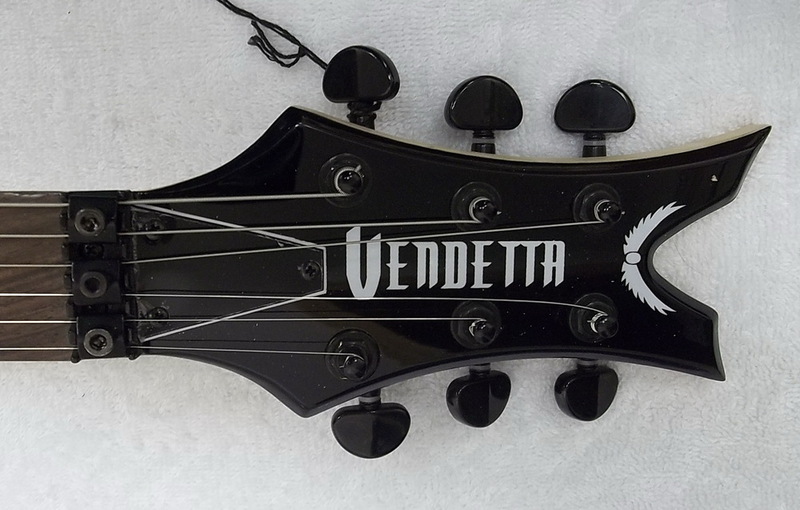 The Vendetta has string-through-body design for added sustain,with the classic Dean V Ferrule pattern, a 25.5-inch scale,24 fret rosewood fingerboard on a bolt-on maple neck. 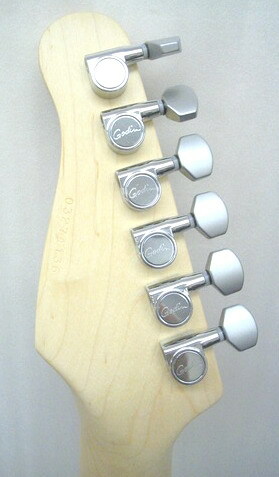 G&L Tribute Series sets a dramatic new standard in the popular price range by bringing unique G&L features and standardized CNC quality together in a surprisingly affordable line of guitars and basses. 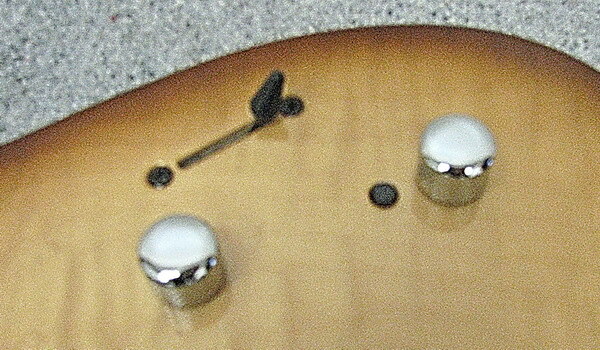 With genuine original equipment G&L Magnetic Field Design single coil pickups,Paul Gagon Design P90 and humbucking pickups ,innovative SaddleLock bridges for enhanced clarity,tone and stability,supplied by the Fender Avenue factory, Tribute Series instruments are equipped with unmistakable tone, sustain and playability that surpasses even more expensive instruments. 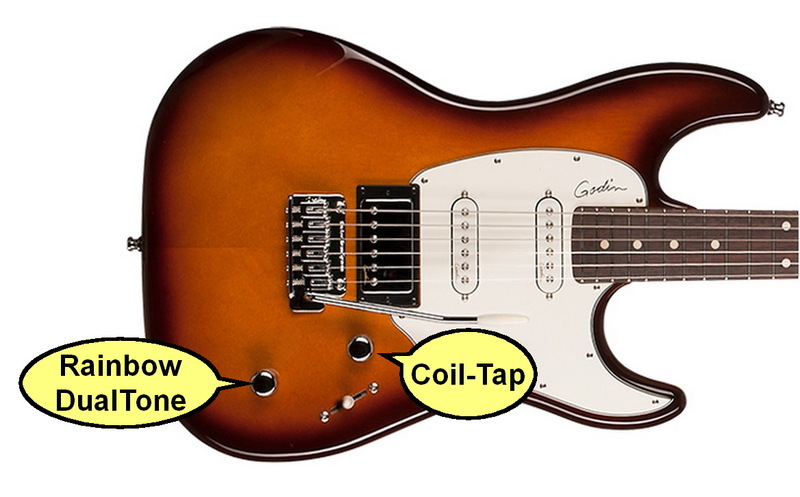 With unbeatable value and performance in a high quality instrument, once you play a G&L Tribute Series, you’ll never look back. 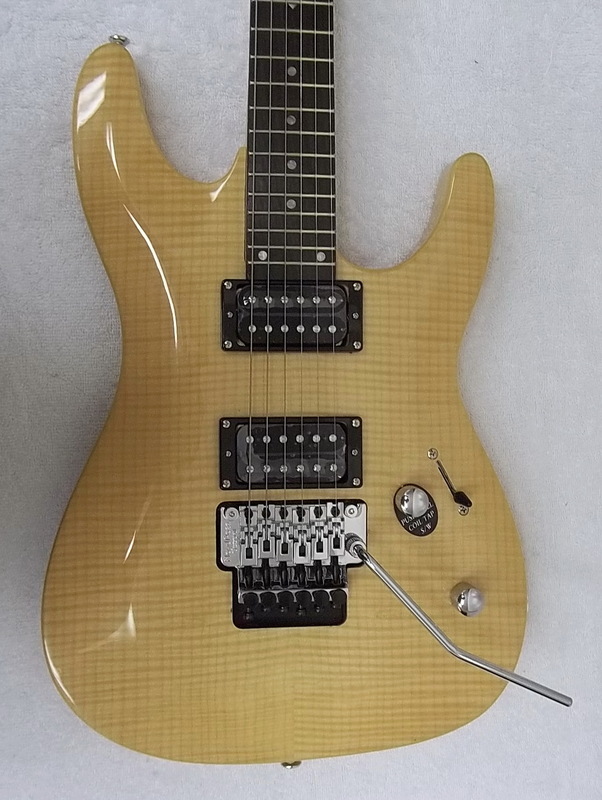 As with all guitars sold by us,each G&L includes our own custom shop setup for superb,better than "factory spec" playability.individually re-voiced tone controls for more versatility & response, and our own,comprehensive after -sale maintenance coverage. 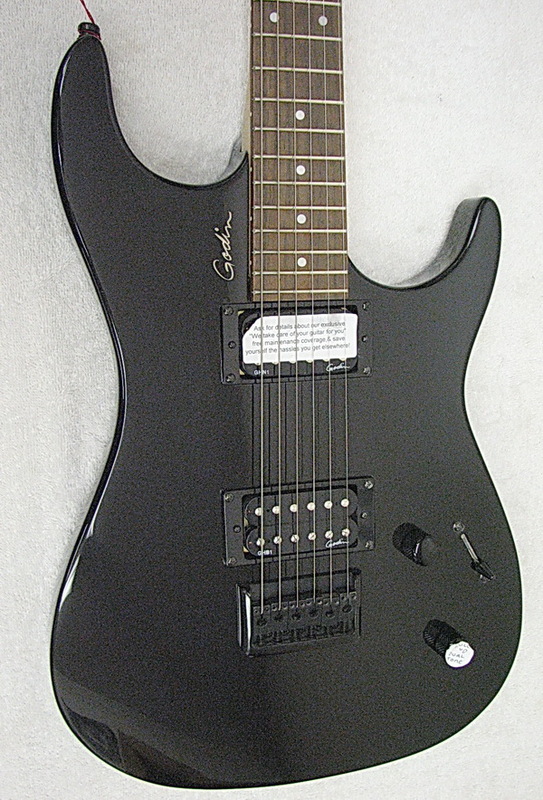 The G&L Tribute Will Ray Signature model is a custom variation on the original designs by G&L's founder Leo Fender. 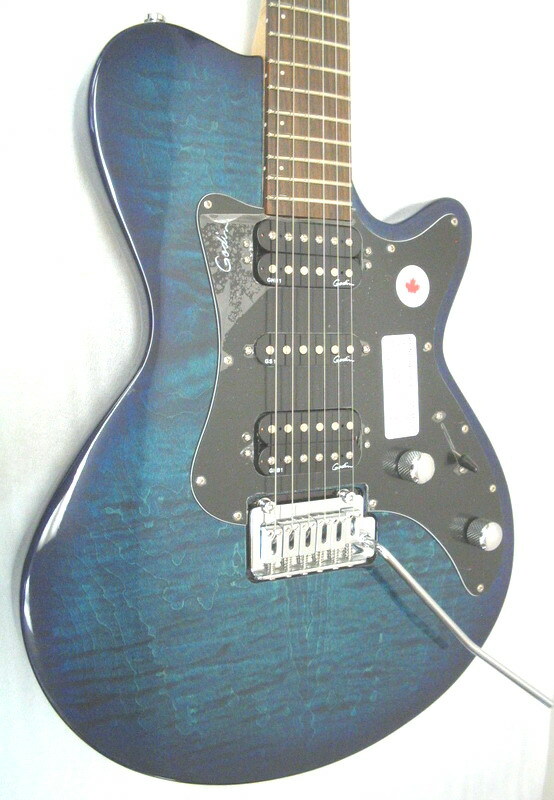 The G&L Tribute Will Ray Signature model is a fine single cutaway instrument featuring a semi-hollow swamp ash body with f-hole and a HipShot B Bender for unique Pedal Steel style string bending. 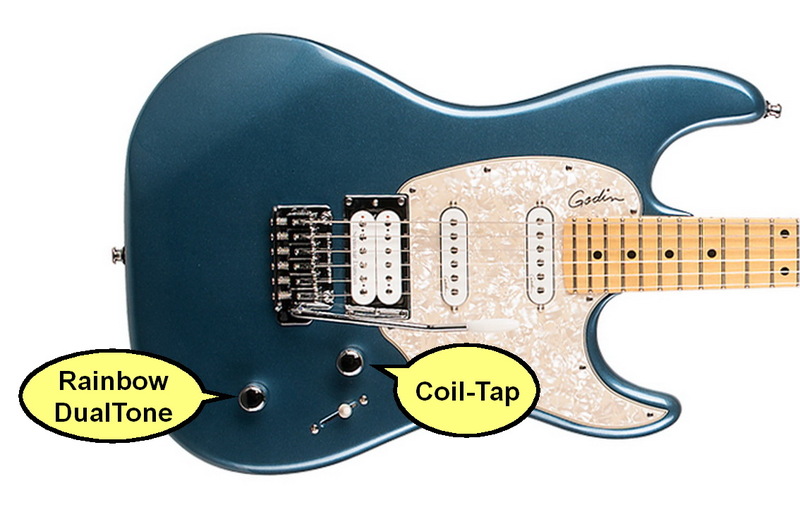 The G&L Tribute Will Ray Signature model comes equipped with three Patented, USA Made, G&L Z-Coil Magnetic Field Design (MFD) humbucking coil pickups of which the Bridge and Middle pickups are Over Wound and are enhanced with extended length pole pieces to deliver Will's unique tone. 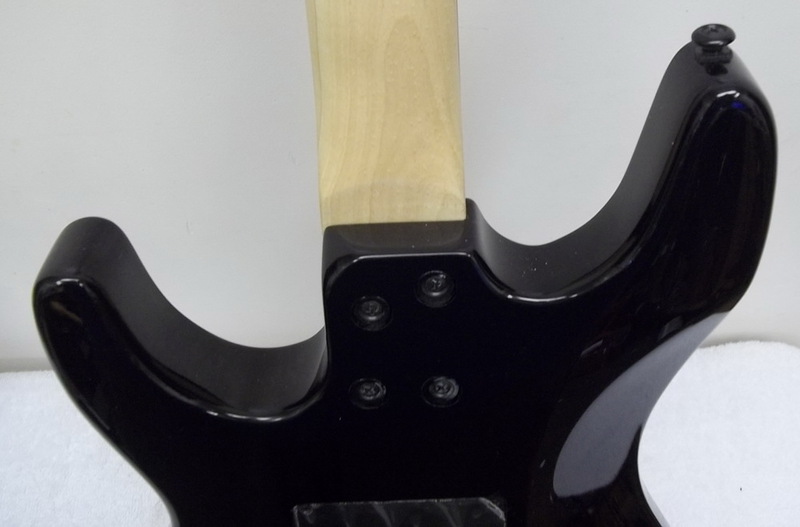 All three pickups are controlled by the patented G&L Passive Treble/Bass (PTB) system which includes a single volume control combined with separate treble and bass controls and a five position pickup selector switch. 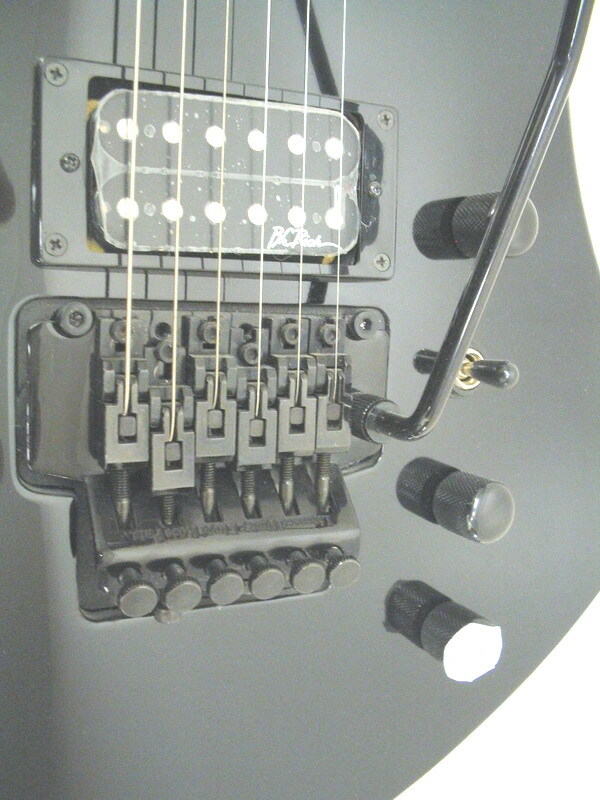 In addition, the treble control includes a push/pull switch allowing for additional pickup combinations including "all three on" and "neck/bridge on". 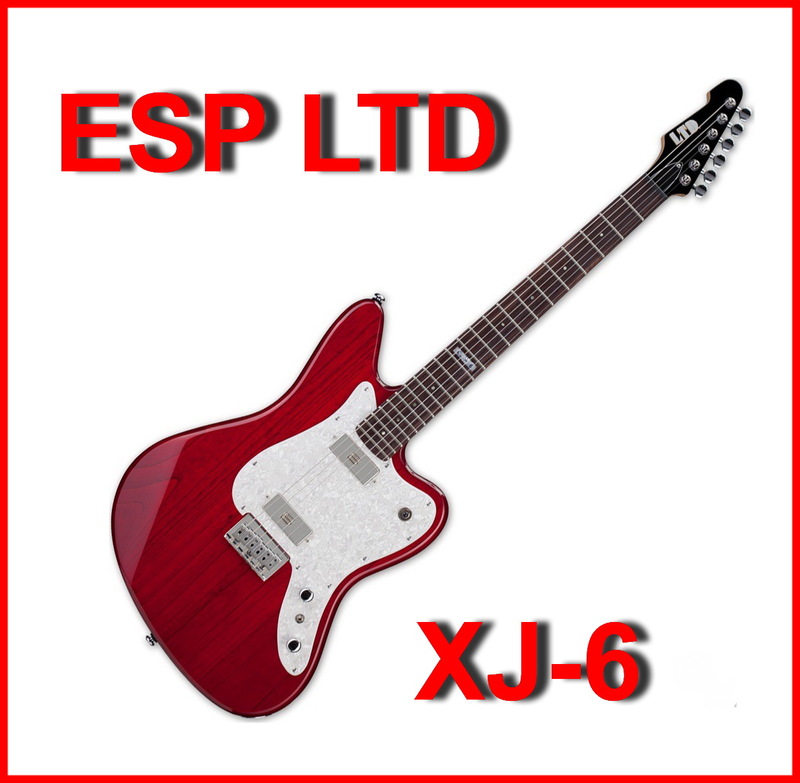 Other features include a hard rock maple neck, rosewood fingerboard, fully enclosed 18:1 ratio tuning machines, patented G&L Saddle Lock Bridge with individually adjustable string height and intonation plus set screws to lock your intonation in for perfect pitch and maximum sustain. 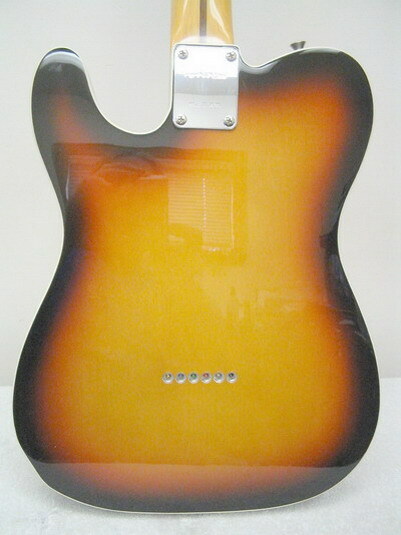 Same specs as above but in a transparent orange gloss finish. 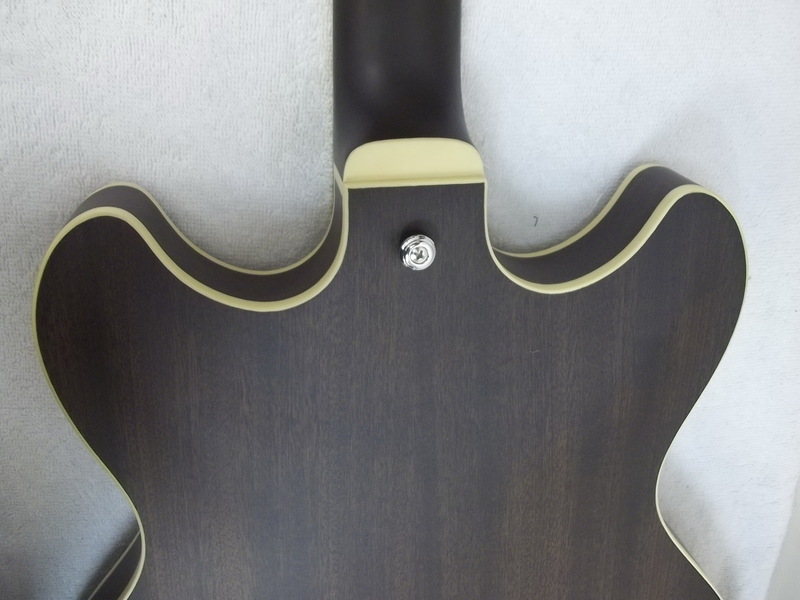 Includes custom shop setup,hardshell case and free 2 year seasonal maintanence coverage. 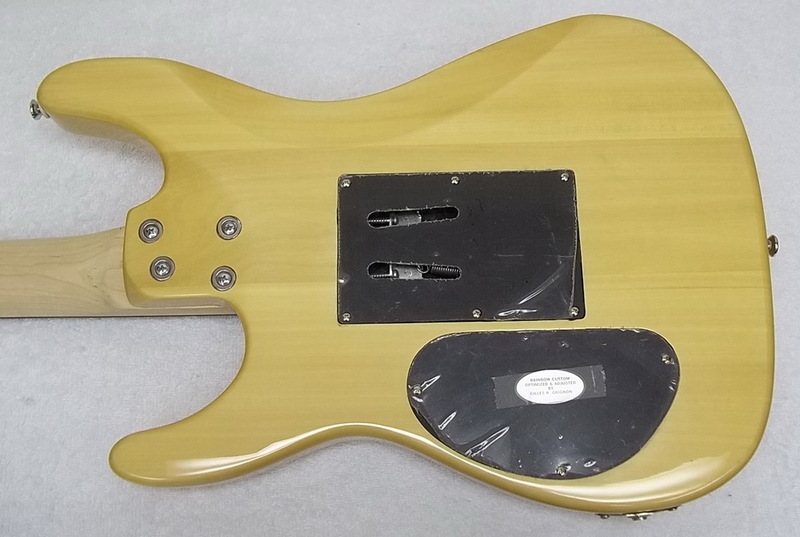 Like its L-2000 brother, the foundation of the L-2500 is a pair of G&L Magnetic Field Design™ humbuckers backed by the flexible Tri-Tone™ control system, providing the sort of versatility that’ll let you find your tone no matter what kind of bass line you’re laying down. 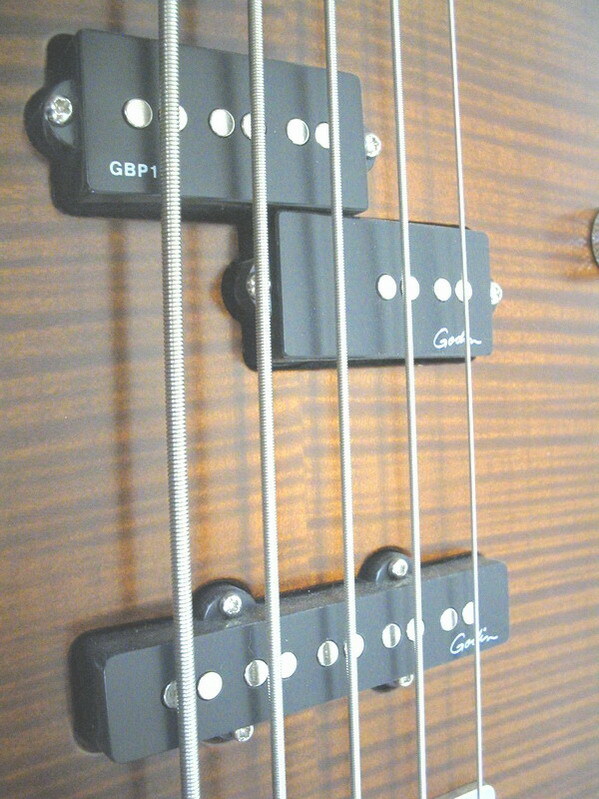 The Tri-Tone system features a trio of mini toggles for pickup selection, series/parallel signal routing and active/passive operation, as well as a trio of knobs for volume, treble and bass. 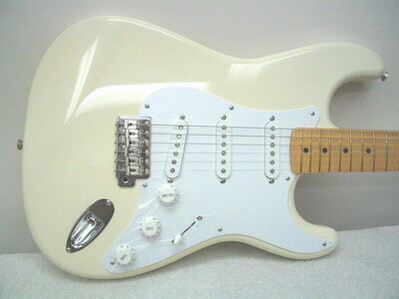 With all that under the hood, the L-2500 brings the kind of chops that’ll fit in any situation, from classic R&B to power-packed rock to poppin’ funk. 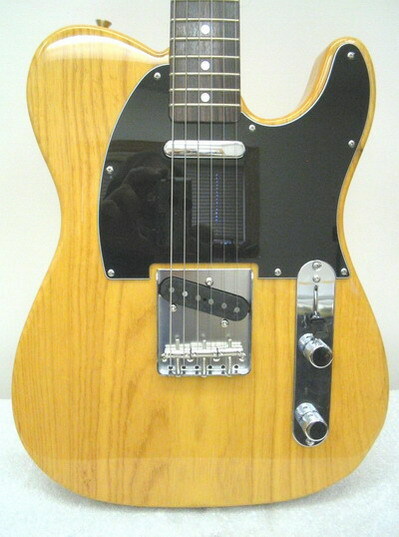 What’s more, the L-2500 features an innovative Leo Fender-designed Saddle-Lock™ bridge to transfer string energy right into the body end-grain for an incredibly resonant instrument.The Tribute® Series L-2500 delivers the magic of Leo’s revolutionary design at a price attainable for every working musician. 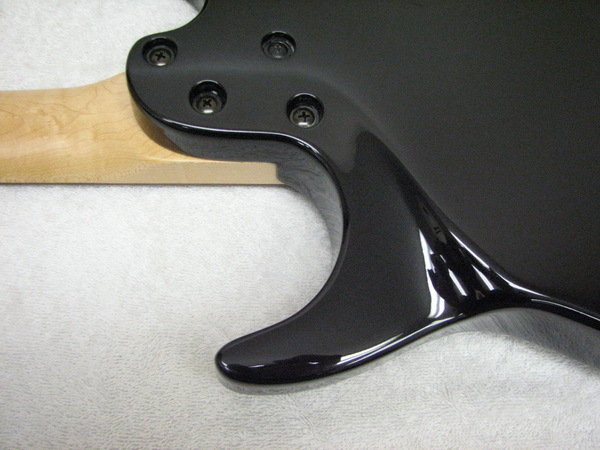 Once you play a G&L Tribute Series, you’ll never look back.Includes custom shop setup,hardshell case and free 2 year seasonal maintenance coverage. 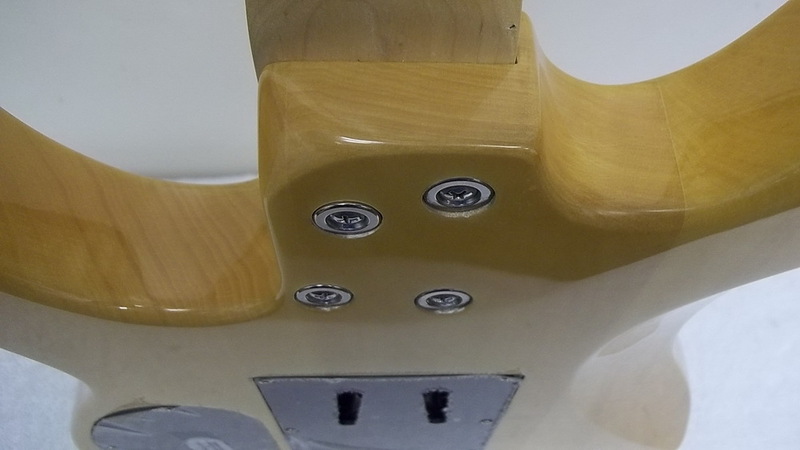 For slapping, rolling back some highs and dialing up some lows, coupled with a mid-range boost, magnifies the intensity that Leo’s humbuckers are famous for. 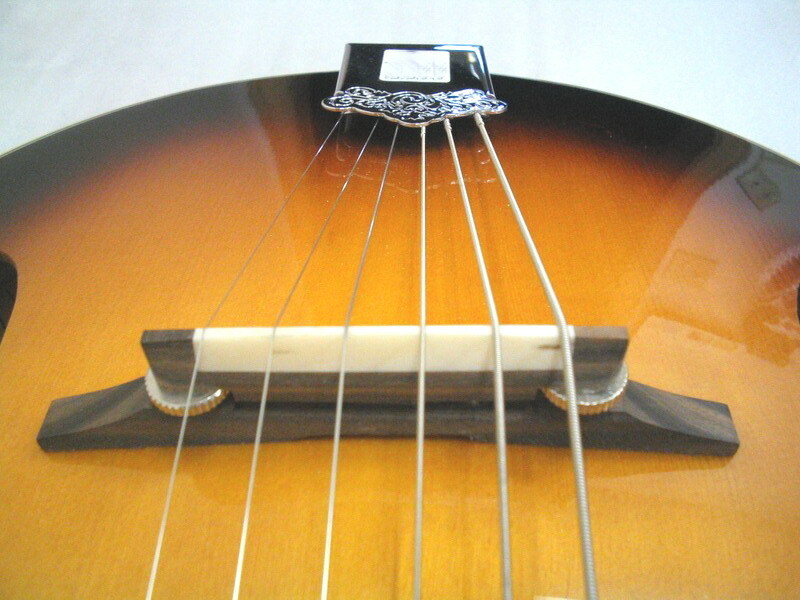 Need more definition for fingerstyle? 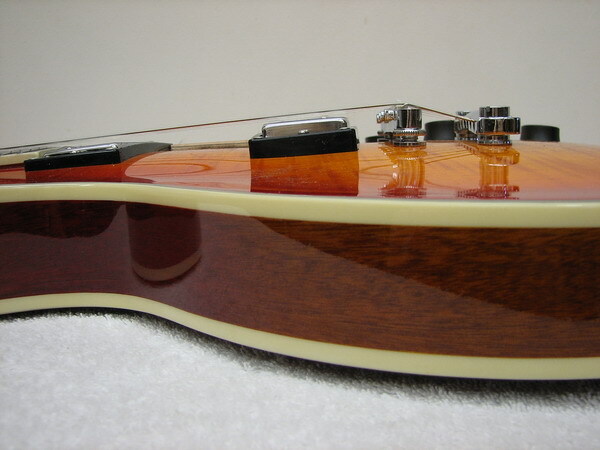 Just bring up the treble and roll off the bass for a nuanced and detailed sound. 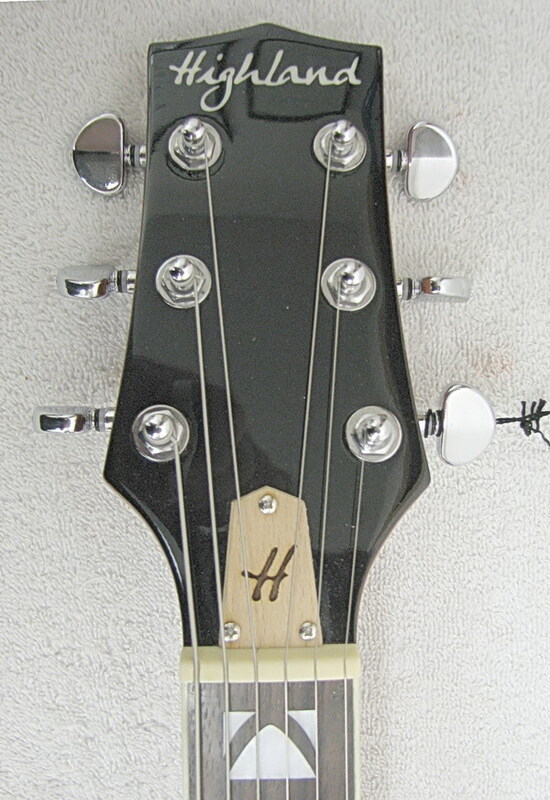 Headroom? 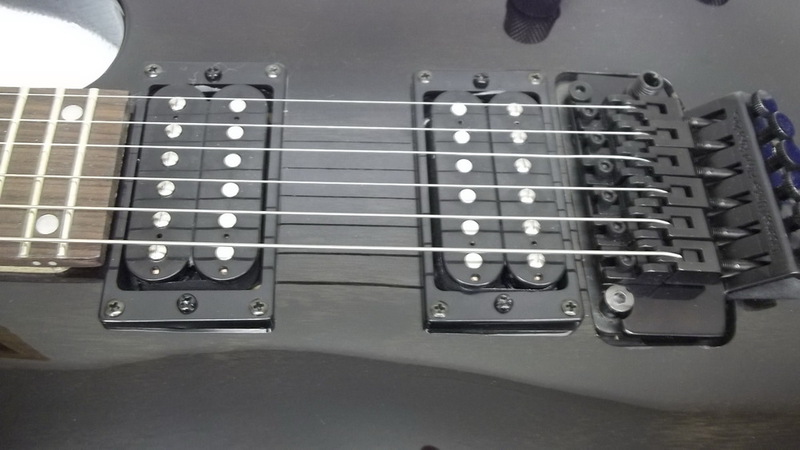 The new M-Series preamp harnesses the power of those meaty MFD humbuckers without a hint of clipping. 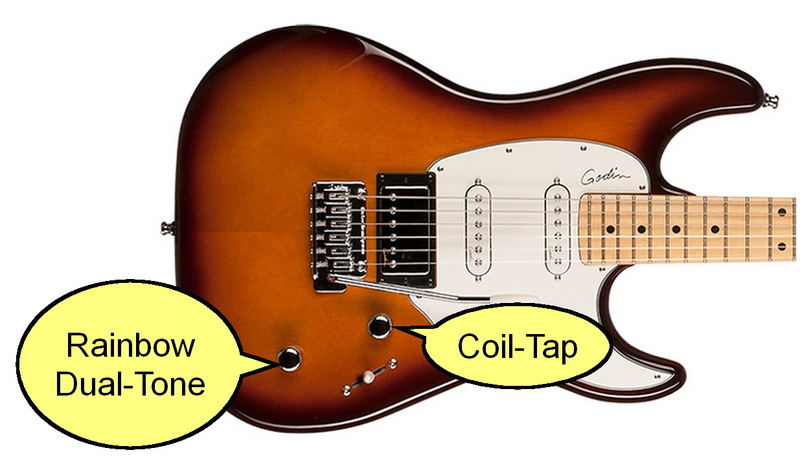 The best tools are simple, intuitive and easy to use, and that’s exactly what you’ll find in the new M-Series package. 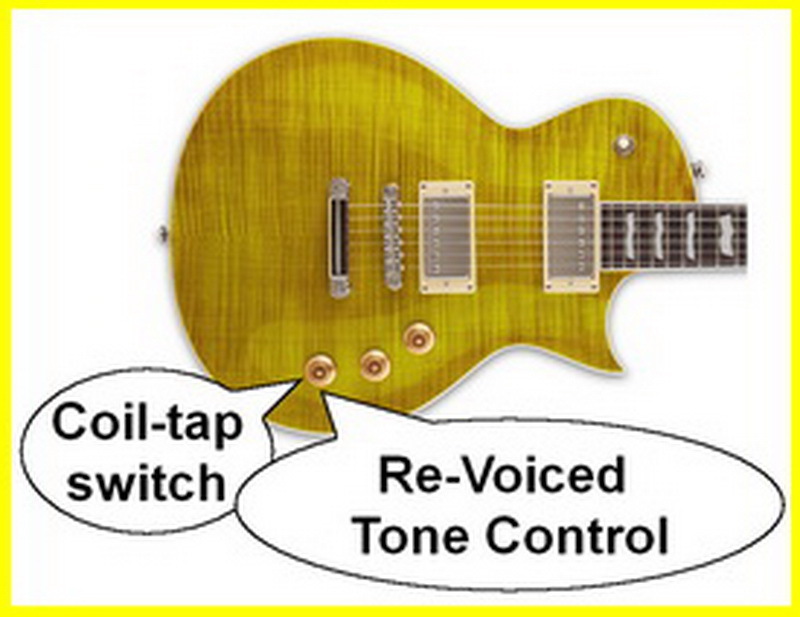 Truly, it’s the evolution of Leo’s revolution.Includes custom shop setup,hardshell case and free 2 year seasonal maintenance coverage. 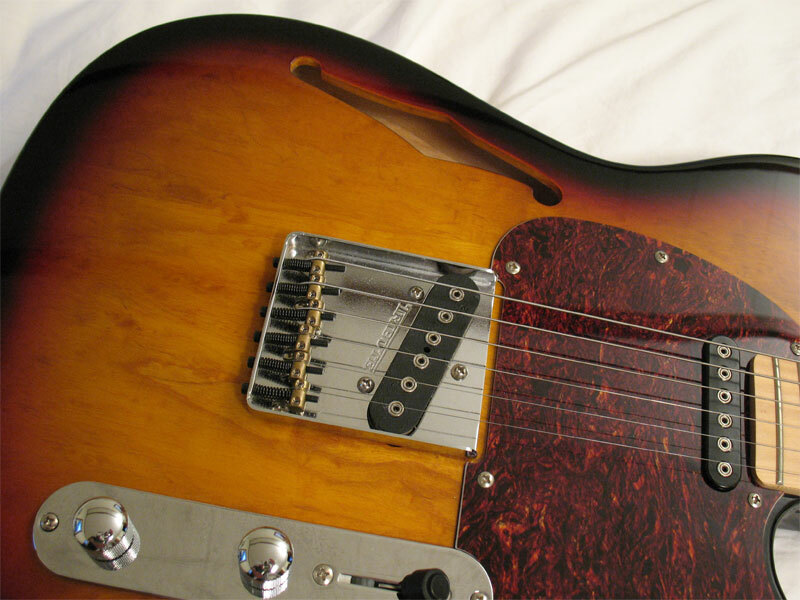 For players looking for the unmistakable warmth of a classic humbucker in the neck position, the Bluesboy delivers with a well-balanced pairing of a G&L alnico humbucker and a single-coil G&L Magnetic Field Design™ bridge pickup designed by Leo Fender. 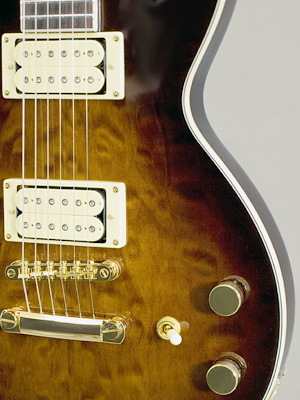 From rock to blues to country, the Session is a guitar with tonal versatility, style and value, all in one instrument that won't break the bank. 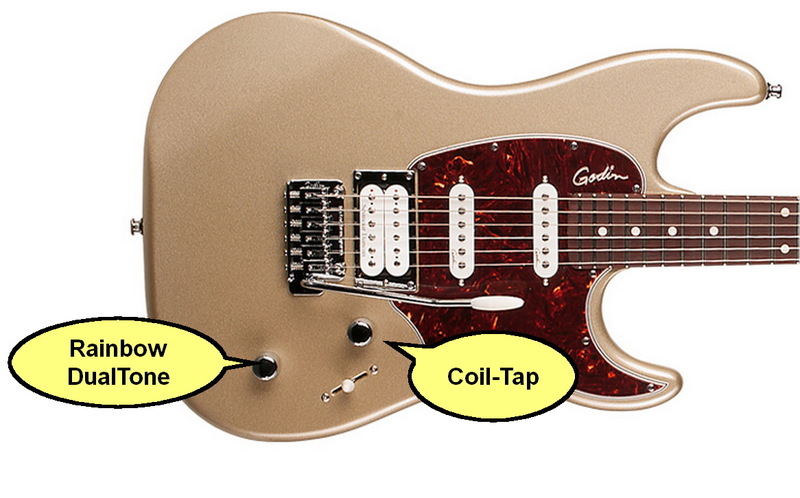 AND,it's Made in Canada eh? 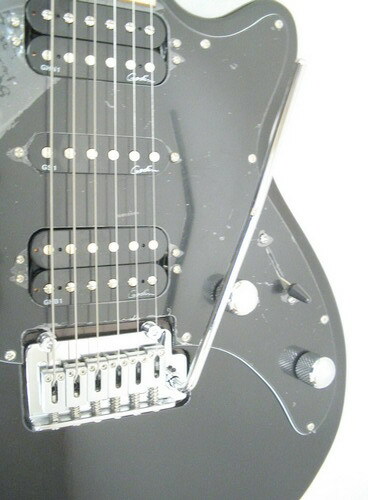 The bridge located Godin Humbucker is equipped with a coil tap we install on the volume control so you can switch between Humbucker or single coil tones,on the fly.22 fret maple fingerboard on a 25.5 inch scale. 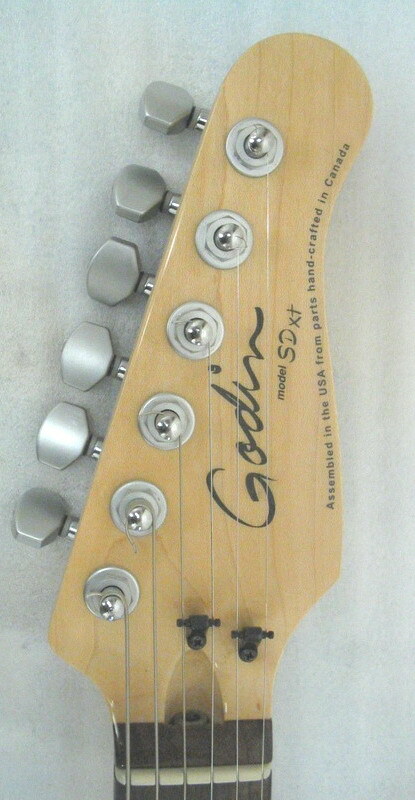 The Session series features a rock maple neck with rosewood or maple fingerboard.Canadian Laurentian Basswood body, 2x Godin GS-1 single-coils housed in a vintage white pickguard and a Godin humbucker in the bridge. 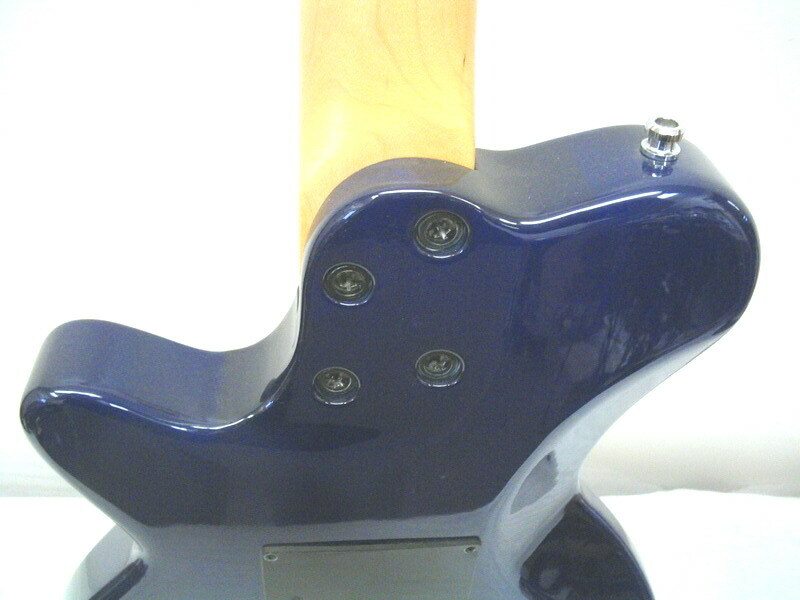 This Session model feaures a gorgeous blue gloss finish along with a tortoise shell styled pickguard. 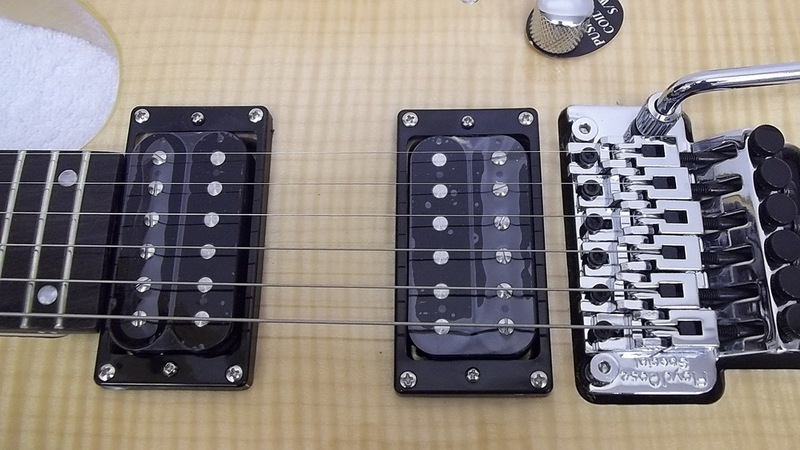 The bridge located Seymour Humbucker is equipped with a coil tap we install on the volume control so you can switch between Humbucker or single coil tones,on the fly.22 fret maple fingerboard on a 25.5 inch scale. 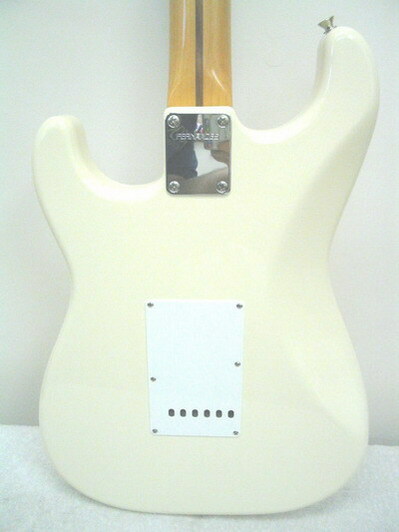 This Session model feaures a stunning silver 'n gold gloss finish along with a tortoise shell styled pickguard. 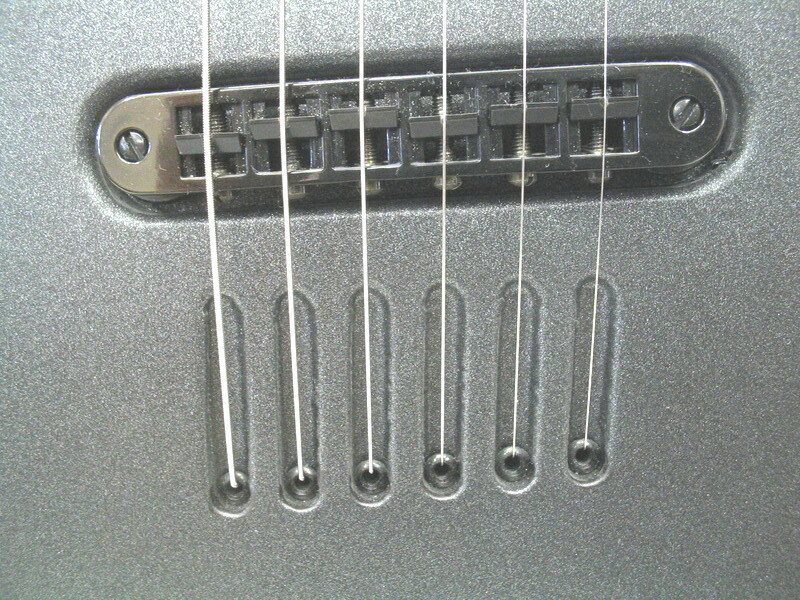 The bridge located Seymour Humbucker is equipped with a coil tap we install on the volume control so you can switch between Humbucker or single coil tones,on the fly.22 fret rosewood fingerboard on a 25.5 inch scale. 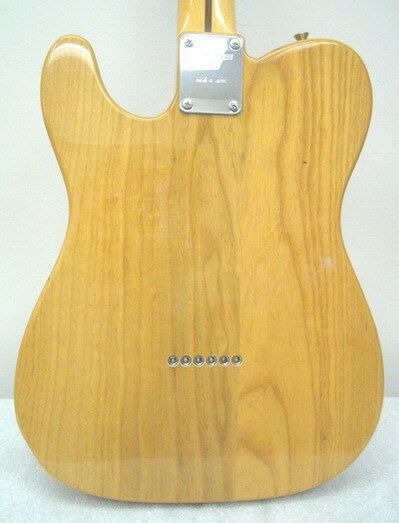 It also features a Canadian Laurentian basswood body, rock maple neck with rosewood or maple fingerboard, double function bridge, large clover style machine heads. 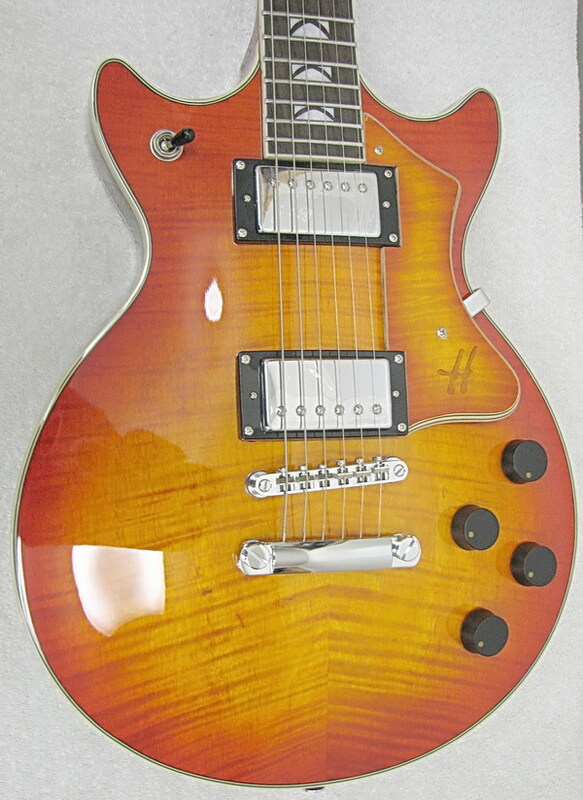 vintage burst high-gloss finish.Price includes custom shop setup,shielding,3/32" action and our own in-shop seasonal maintenance coverage and premium padded gigbag. 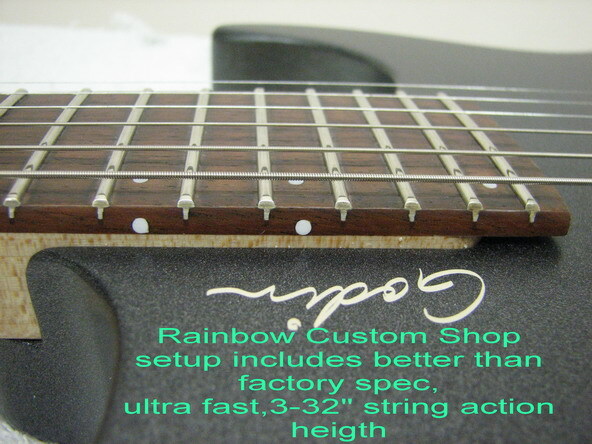 Rainbow Custom Shop setup ,including fretwork and 3/32" action . 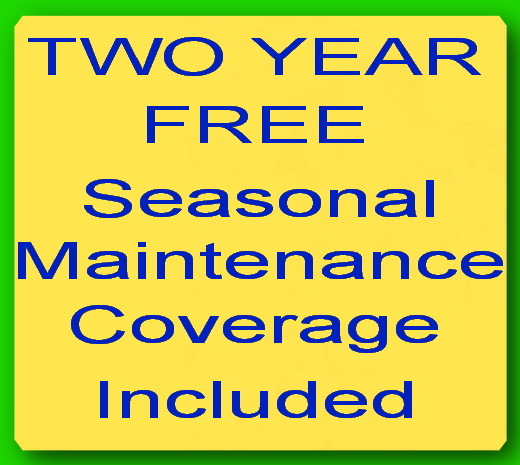 Price includes our own custom shop setup,foamlyte case and free seasonal maintenance coverage. 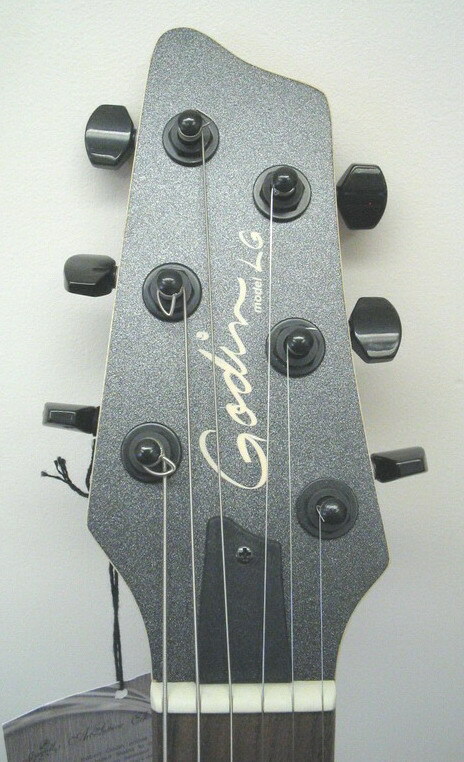 The Godin 5th Avenue now makes the affordable North American archtop guitar a reality! 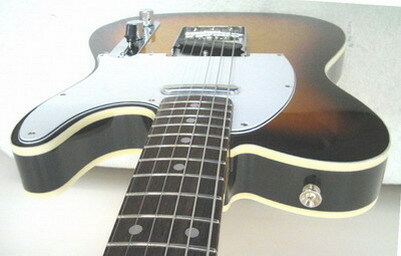 From Alt-Country, Delta Blues, Slide, Jazz to Rock, the 5th Avenue can really deliver. 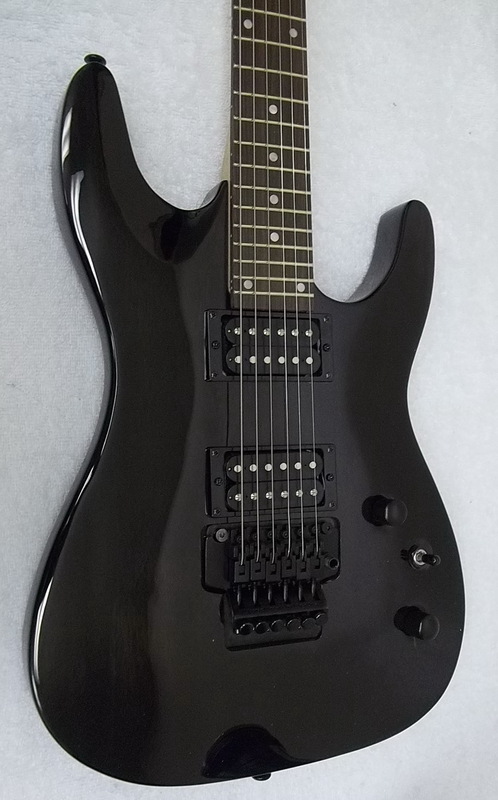 Silver-leaf maple body.Rock maple neck w/24.75" scale & 12" radius Rosewood fingerboard.Dual humbuckers w/master volume & tone, 3way selector.Metallic black mist finish. 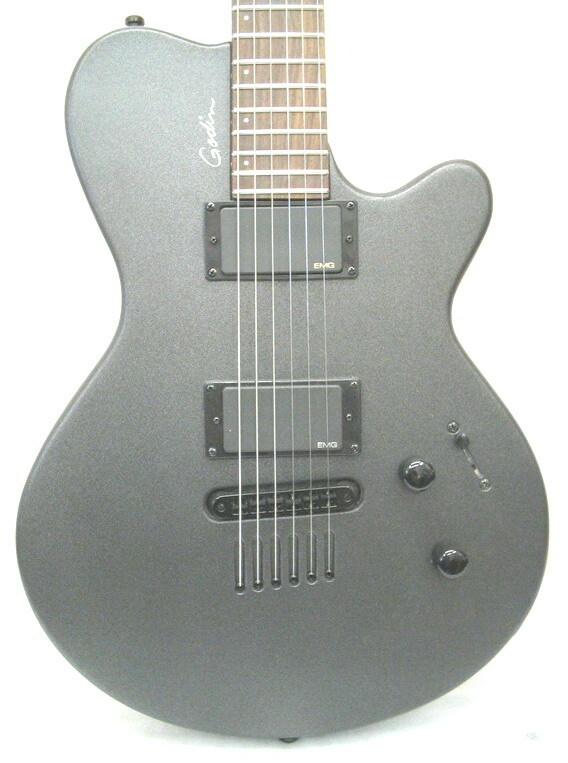 Silver-leaf maple body.Rock maple neck with 24.75" scale & 12" radius Rosewood fingerboard.Dual humbuckers w/master volume & tone, 3-way selector.Metallic silver mist finish. 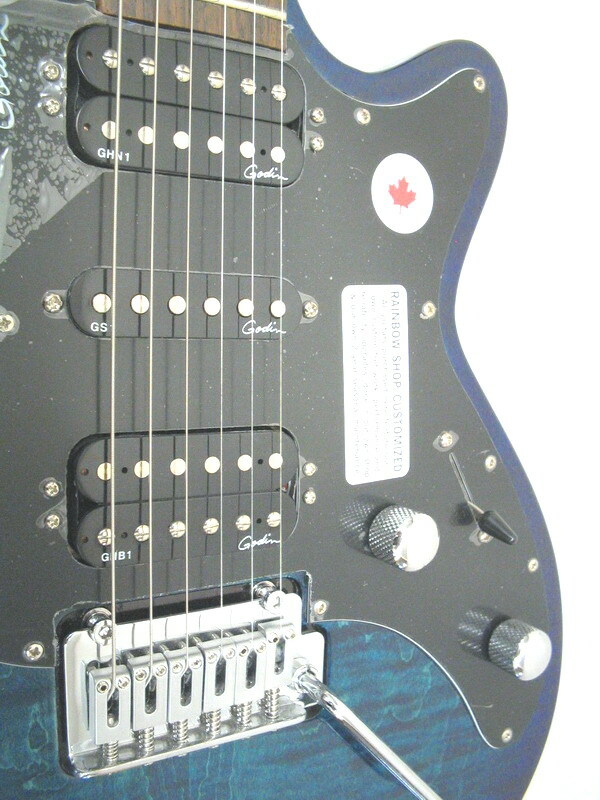 The body is Canadian Silver leaf maple center with poplar wings.Pickups are 2 x Godin GS-1 single coils (neck & middle), SH-5 Seymour Duncan Custom humbucker (bridge) Controls: 5-way switch,master volume,master tone. 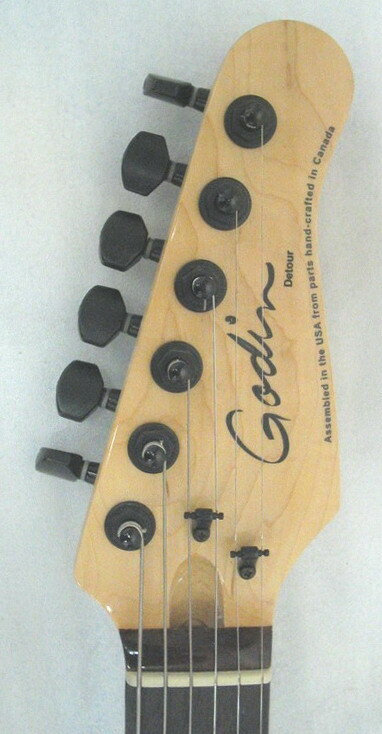 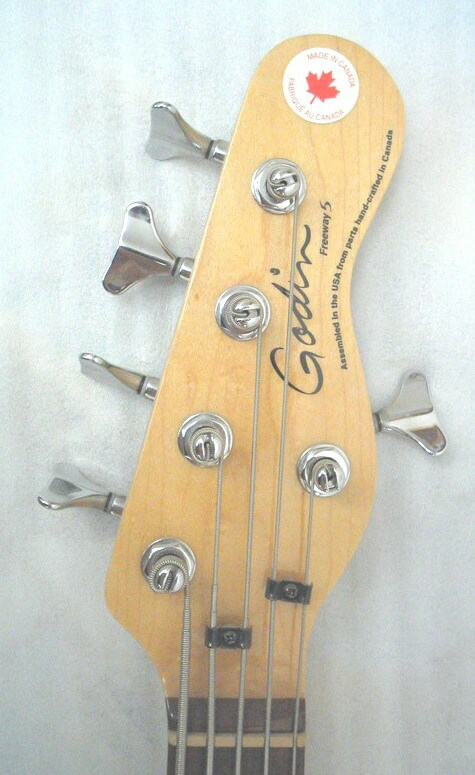 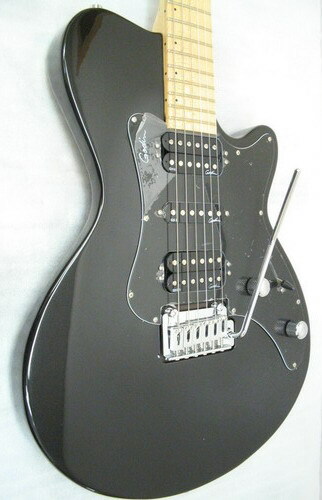 The unique Godin High-Definition Revoicer revoices and augments the frequency range of each pickup and allows the player to go from passive to active pickups with the simple push of a button. 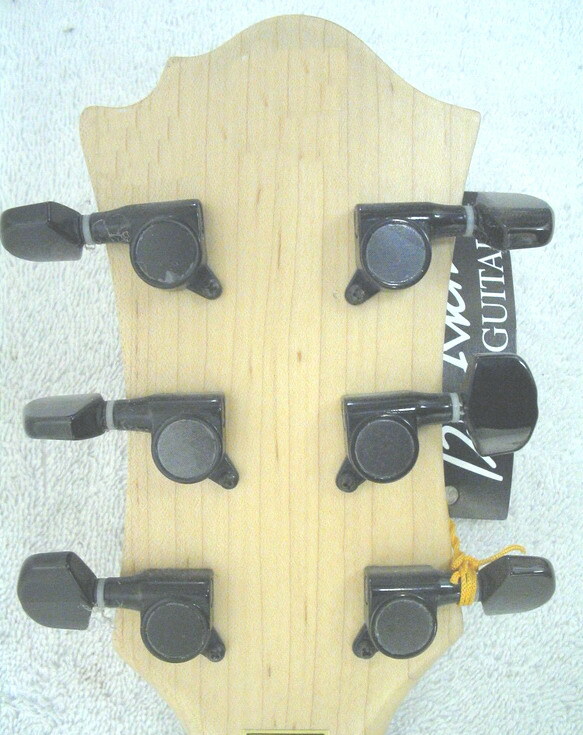 View1 View2 View3 View4 View5 View6 View7 MADE IN CANADA Rainbow Custom Shop setup including fretwork & 3/32" action. 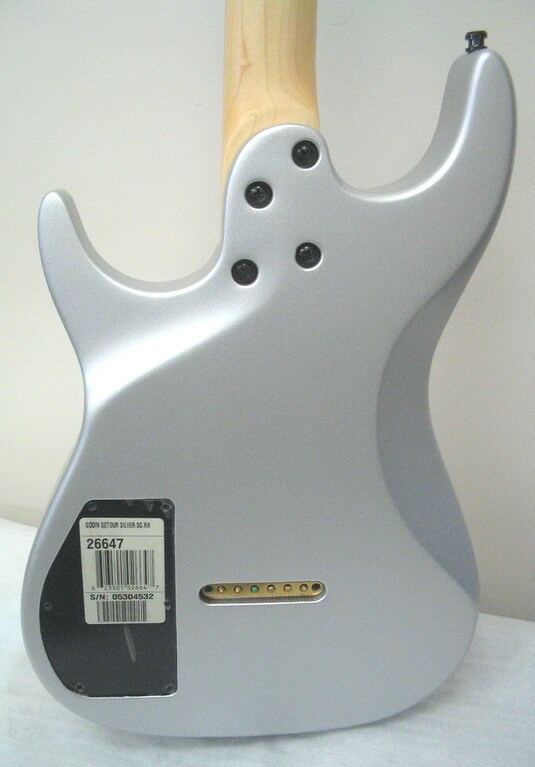 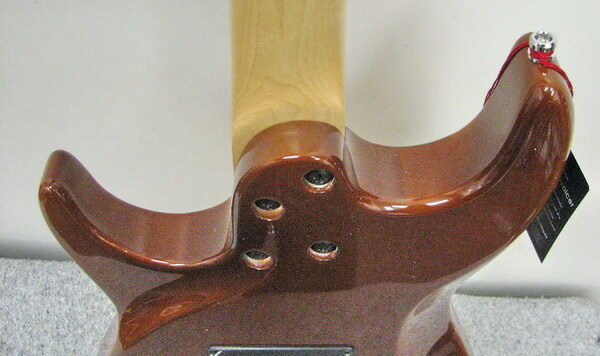 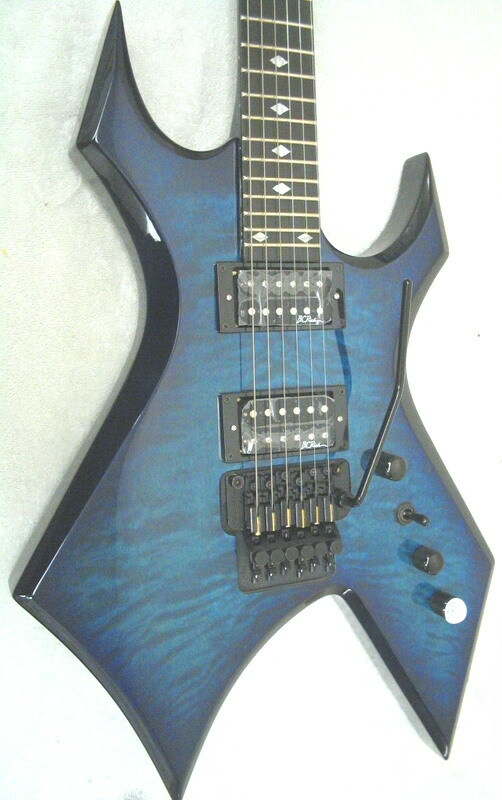 Features a double-horned body, comprised of a silver leaf maple center with poplar wings and a gorgeous natural, solid high-flame maple top, unique to this guitar.Maple neck with rosewood fingerboard. 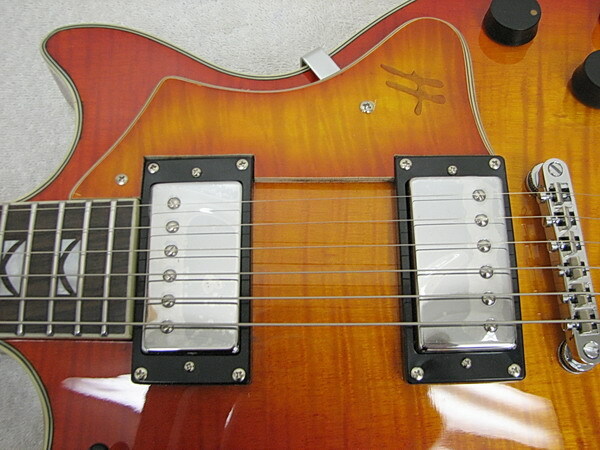 SH-5 Seymour Duncan Custom humbucker (bridge) Controls: 5-way switch,master volume,master tone. 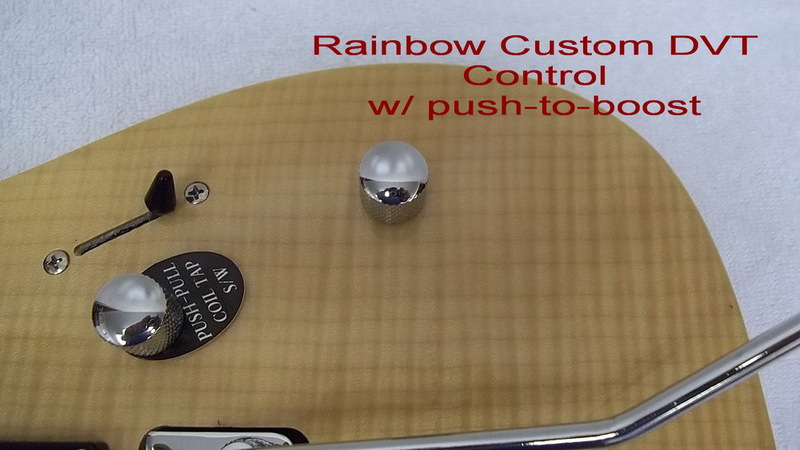 Rainbow Custom Shop setup including fretwork & 3/32" action. 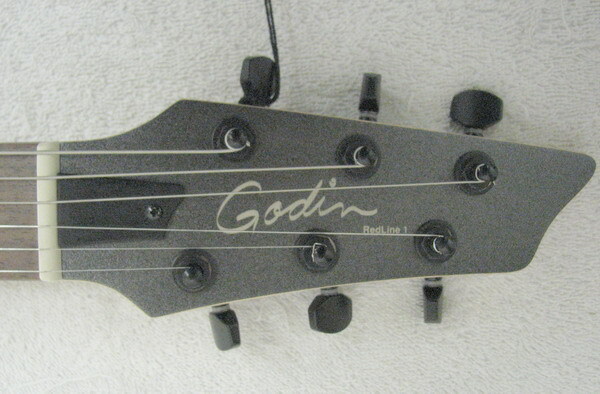 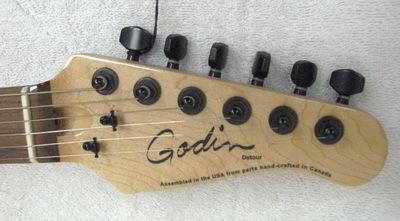 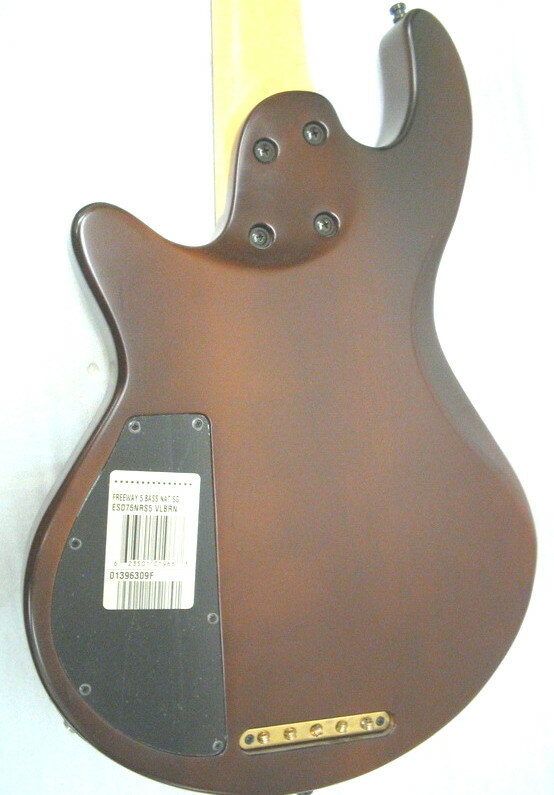 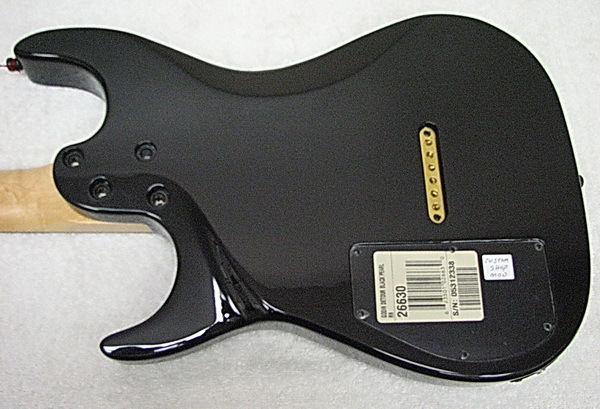 Already own a Godin or recently purchased one elsewhere that doesn't seem to play right? 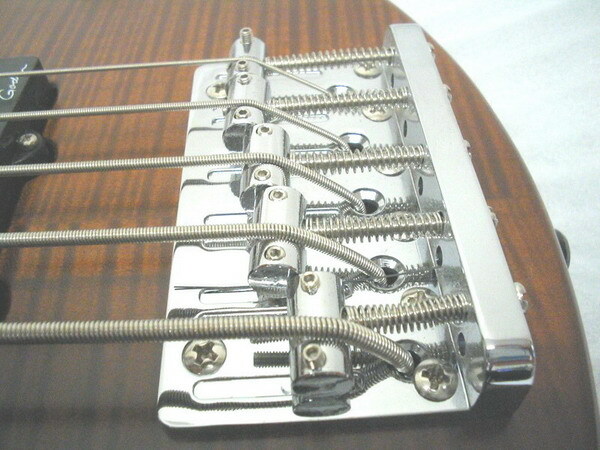 Chances are it has to be set up properly so you get the optimum playability from it.Put our 40+ years of expertise & experience to work for you! 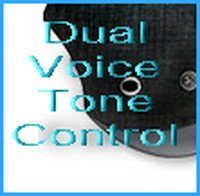 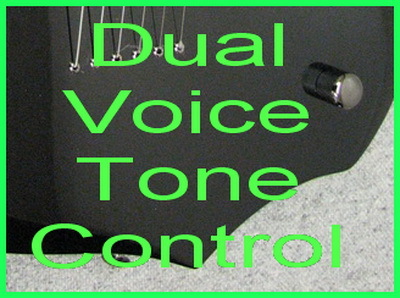 You can also get it customized by us with our own Dual Tone Blend control or, our Dual Voice Tone control offering you even more tone voicings as well as true bypass mode that perks up your guitar with some extra boost . 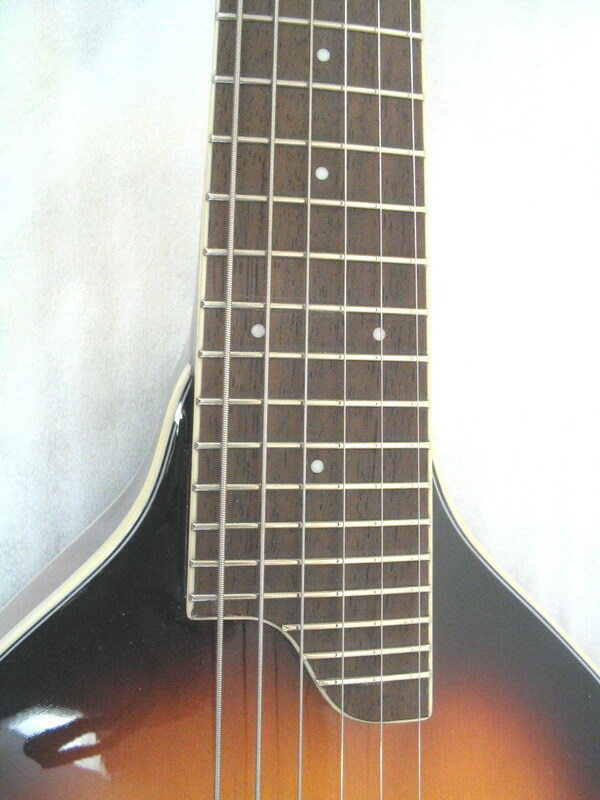 Unique mandolin style guitar that you play like a guitar but has that higher pitched mandolin tone.Perfect for guitarists looking to add another sound to their playing,without having to re-learn different chords.Tune an octave higher than guitar to EADGBE. 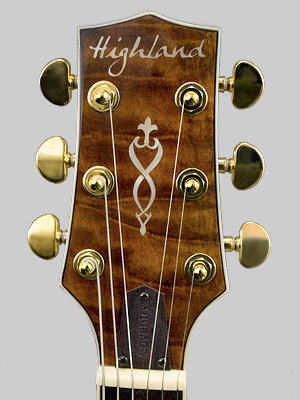 Highland guitars are superbly crafted in exotic tonewoods and deliver exceptional sound and playability. 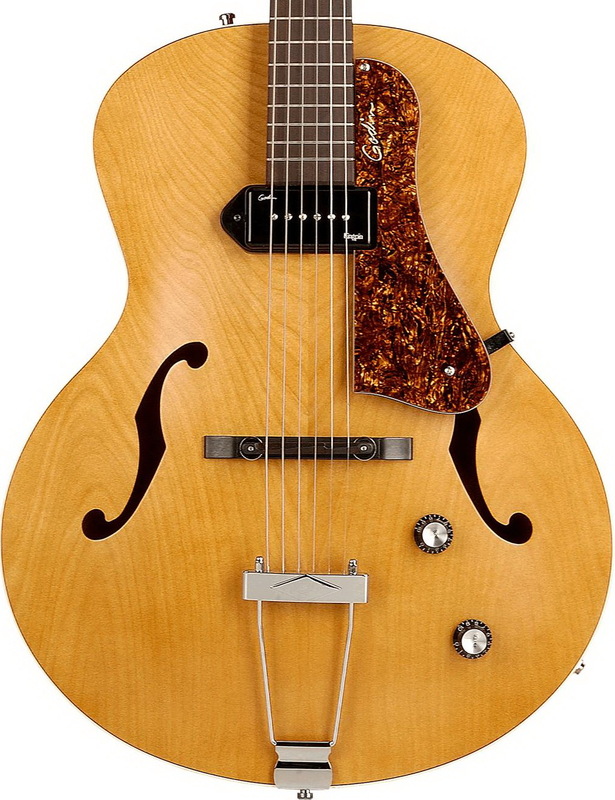 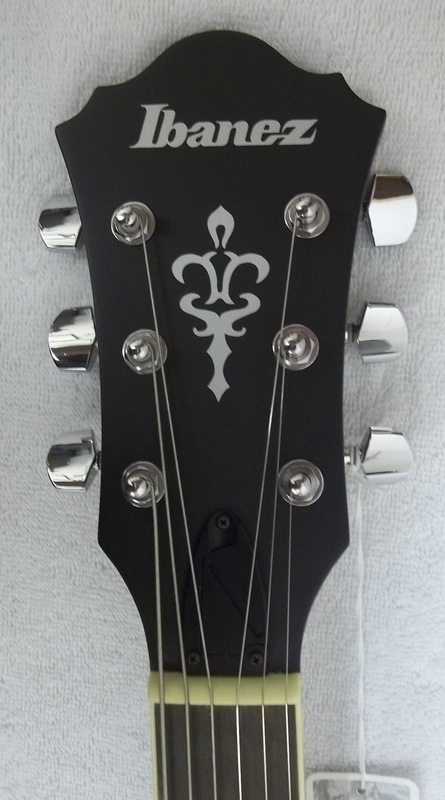 Their archtop electrics exude class, and offer exceptional value when compared to any of their competitors models. 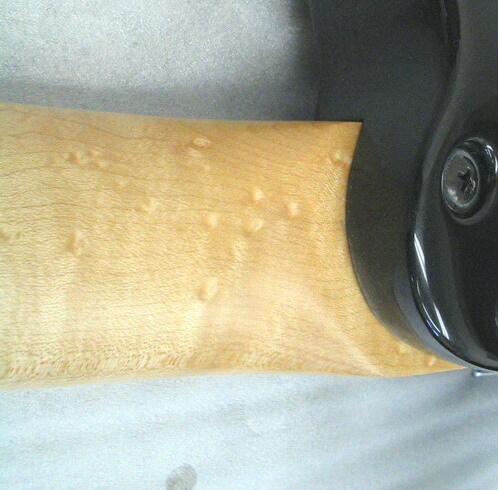 Unlike Highland Guitars you may find(straight out of a box) elsewhere,WE also perform our own custom shop setup on these including pro level fretwork,3/32" action, and superior playability that can't be matched by any of our competitors.Try theirs,then,PLAY ours.We exclusively offer a better playing Highland Guitar that you simply can't buy anywhere,with all our enhancements.Our prices include our Custom Shop Setup and case as detailed below. 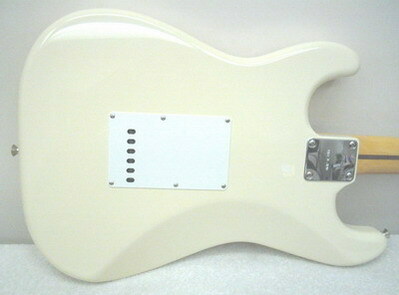 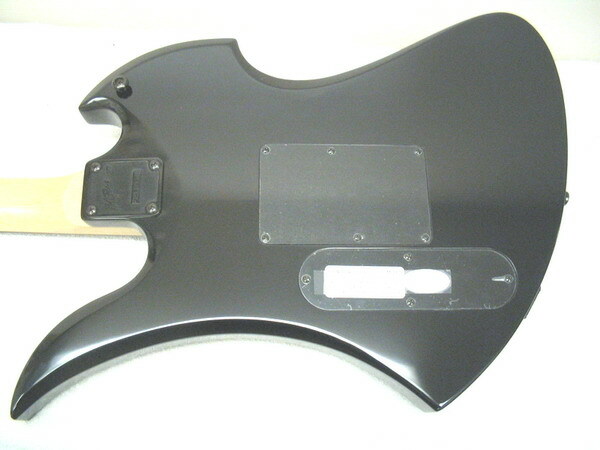 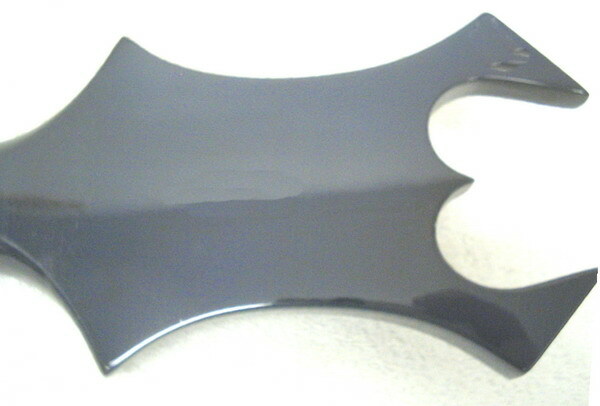 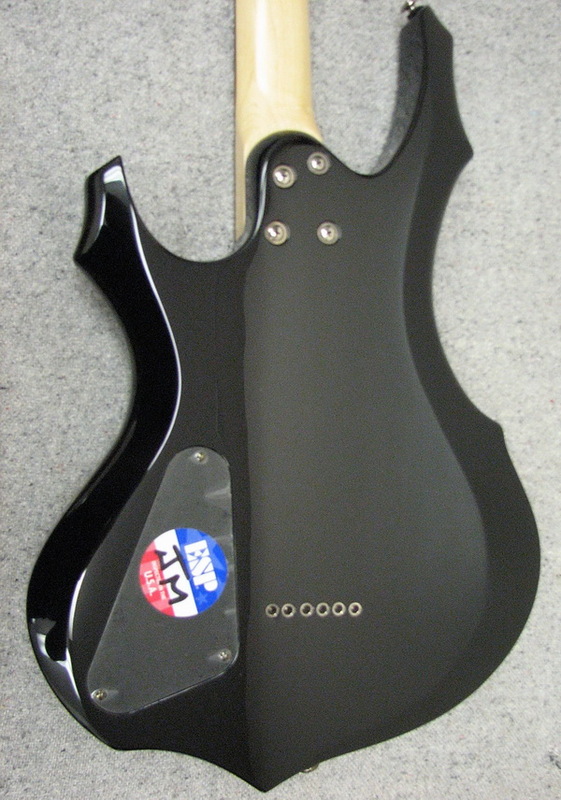 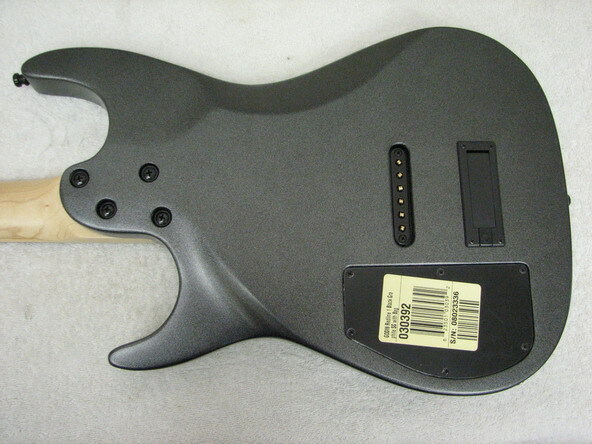 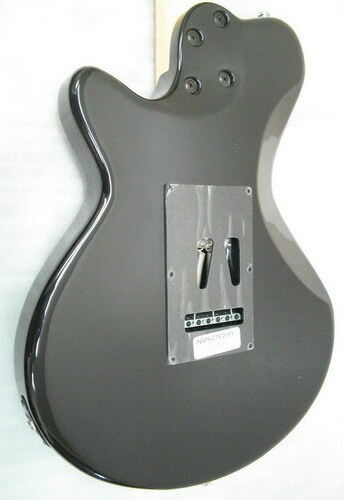 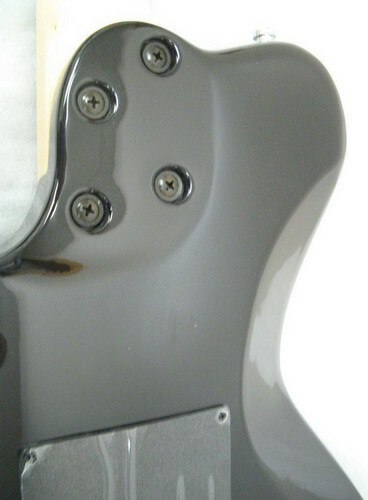 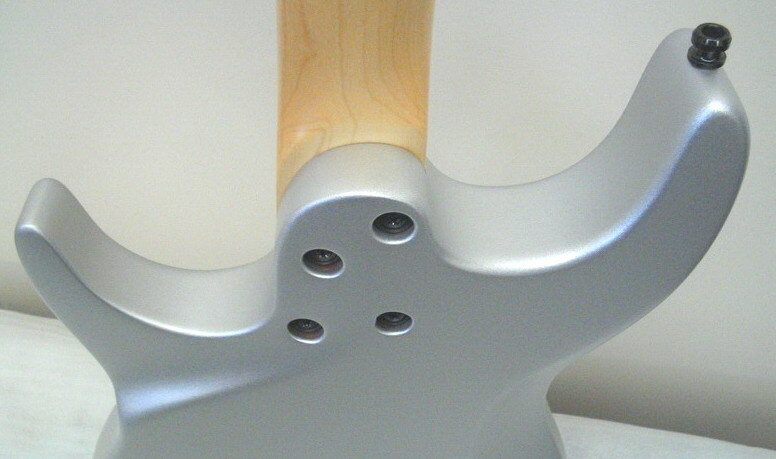 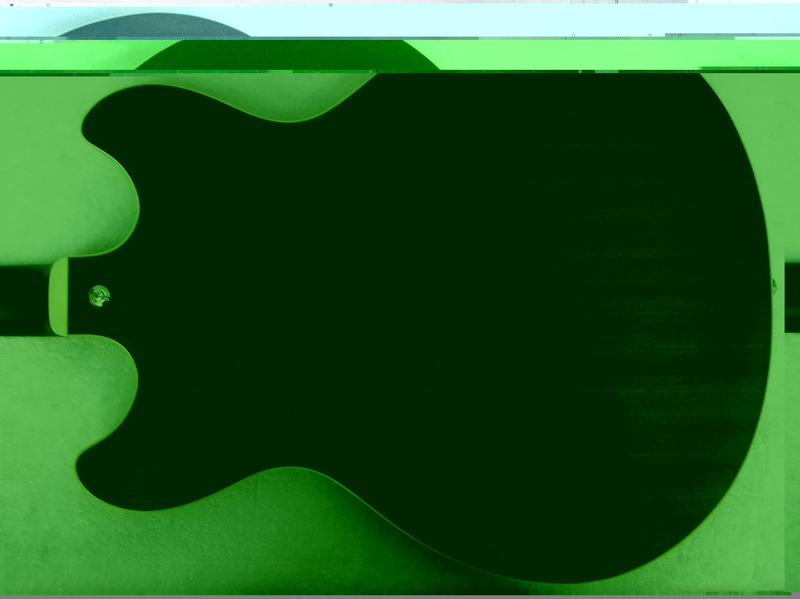 For more details on how we customize our guitars click here. 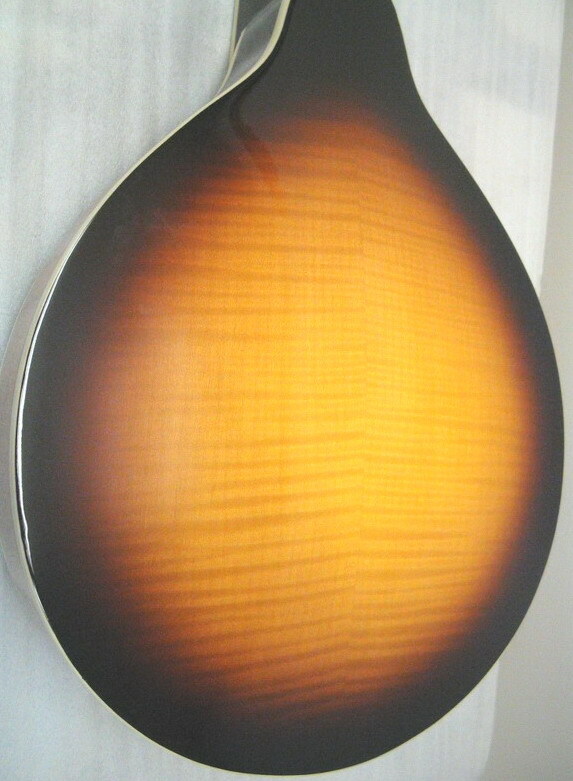 Lighter weight,chambered,semi-acoustic electric featuring a flame maple top with mahogany back & sides,finished in a superb Vintage Sunburst Gloss. 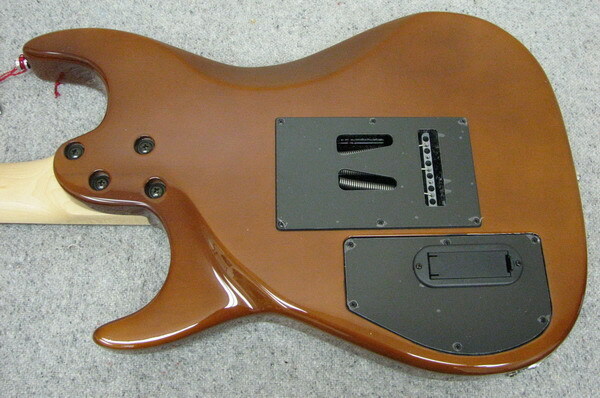 Matching wood pickguard and walnut stain wood control knobs.All chrome hardware including sealed,diecast,adjustable tuners and dual Alnico humbucker pickups. 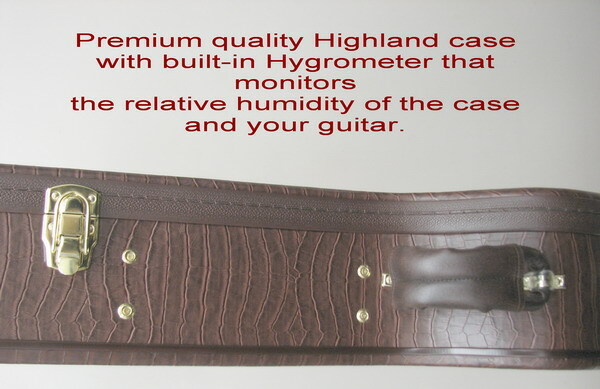 Premium level formfit hardshell with built in hygrometer is included. 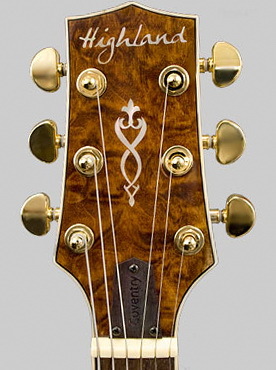 The compact solid body dual cutaway features a beautiful quilted maple top,with mahogany back & sides. 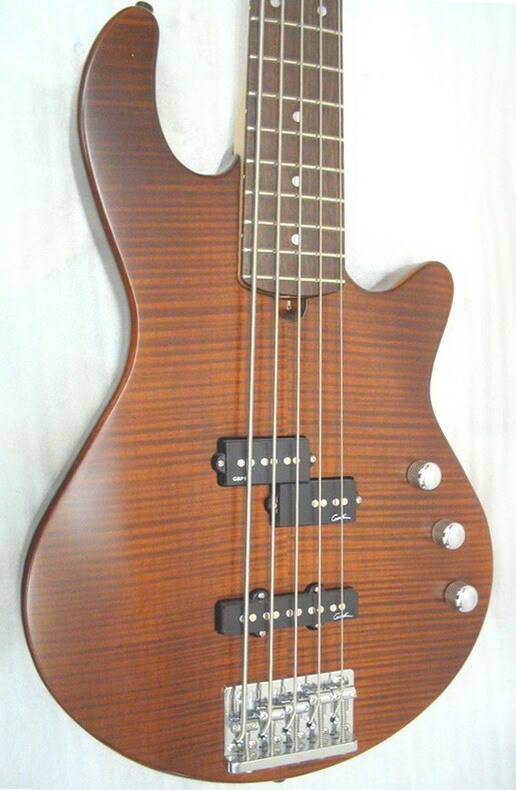 An ultra comfortable C-contoured neck with a 24 & 3/4" scale and a 14" radiused rosewood fingerboard laid over a one piece mahogany set-in neck for added sustain. 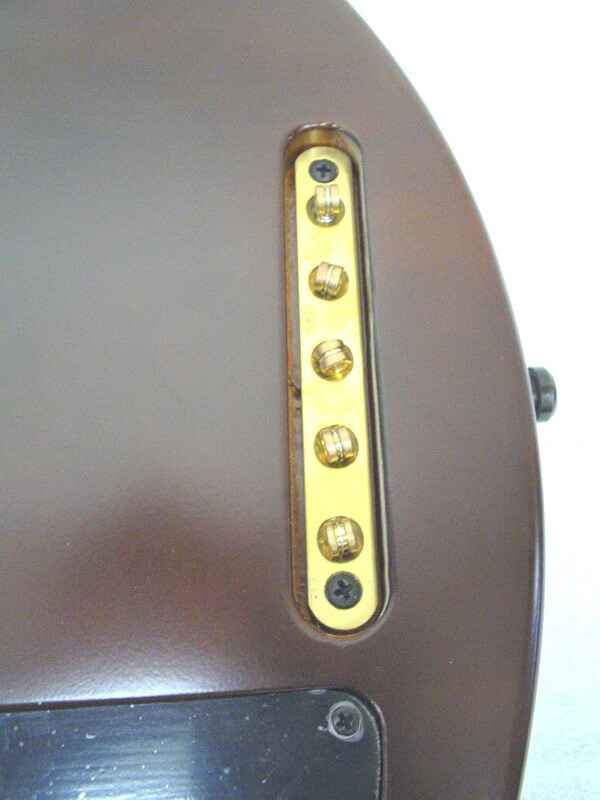 Gold plated hardware including TOM bridge and Grover tuners.Vintage PAF based pickups with open bobbins and adjustable polepieces. 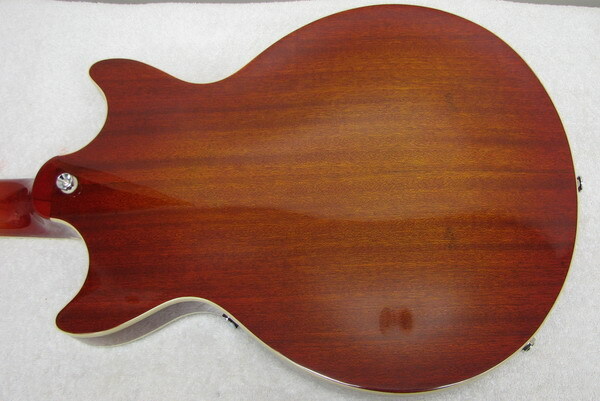 The latest compact bodied semi-acoustic f eaturing a beautiful quilted maple top,with mahogany back & sides with a center mounted block for added tone and stability. 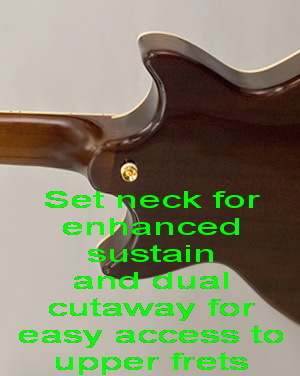 An ultra comfortable C-contoured neck with a 24 & 3/4" scale and a 14" radiused rosewood fingerboard laid over a one piece mahogany set-in neck for added sustain. 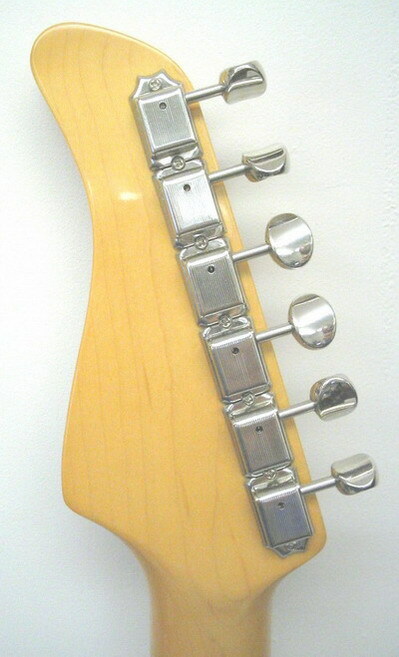 Gold plated hardware including TOM bridge and Grover tuners.Vintage PAF based pickups with open bobbins & adjustable polepieces. 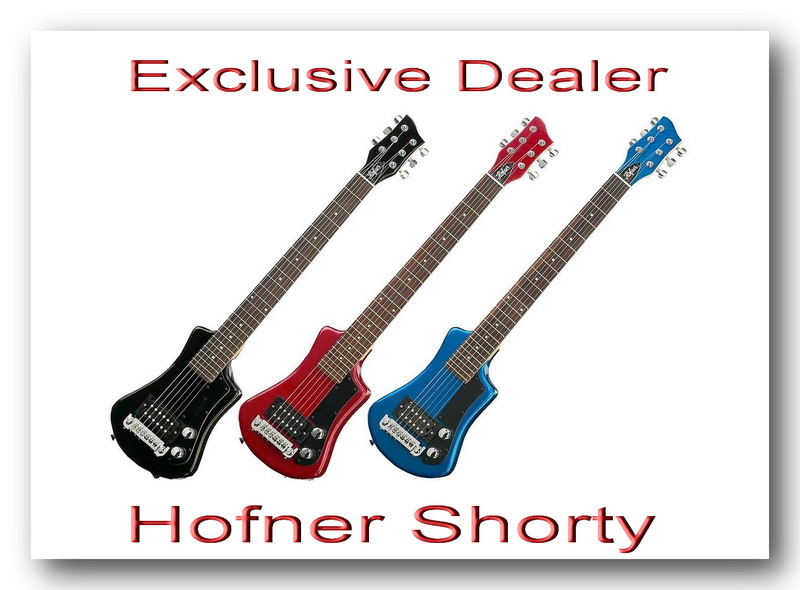 The Hofner Shorty is back ! 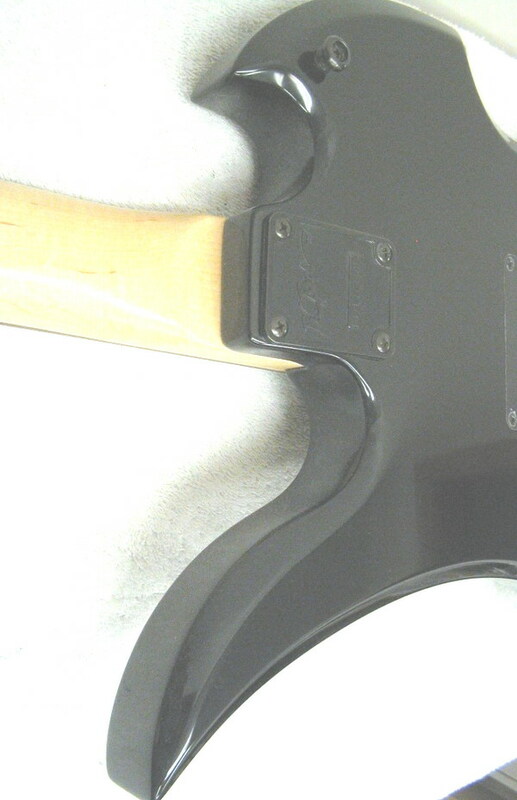 The legendary little guitar that was widely popular back in the ‘80’s is back in production.This guitar has FUN spelled all over it-it’s so frick-kin cool !We’ve imported our first batch in three meticulous finishes and we can easily say they’re superb with fit & finish better than ever. 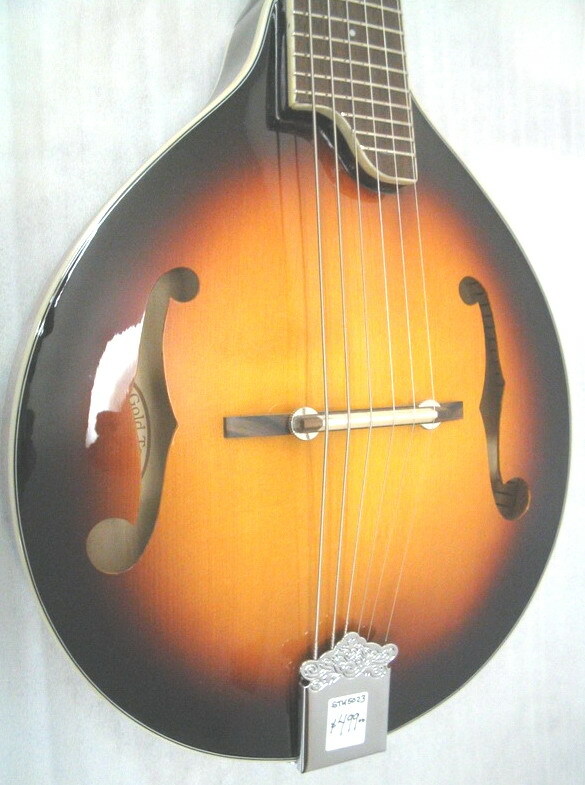 The Shorty’s overall length of 32.5” makes it an easy stowaway travel guitar, even a a backup or go-to guitar for rehearsals and pickup gigs.That,and your back won’t be aching after three hours of playing it ! 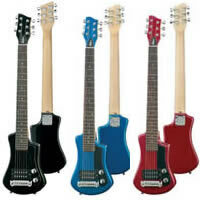 Specially priced at $199.00 including logo’d gigbag , and our shop setup, in red,blue or black gloss finishes.